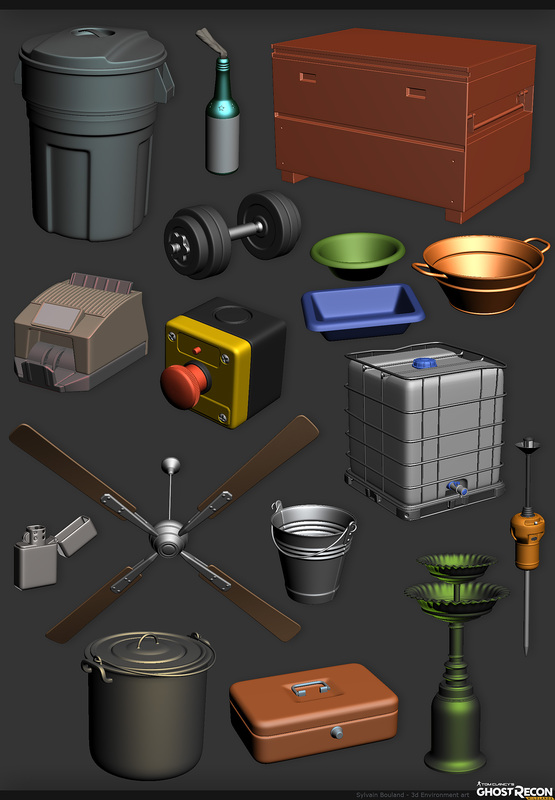 On this ambitious and collective project I was in charge of the game props library. 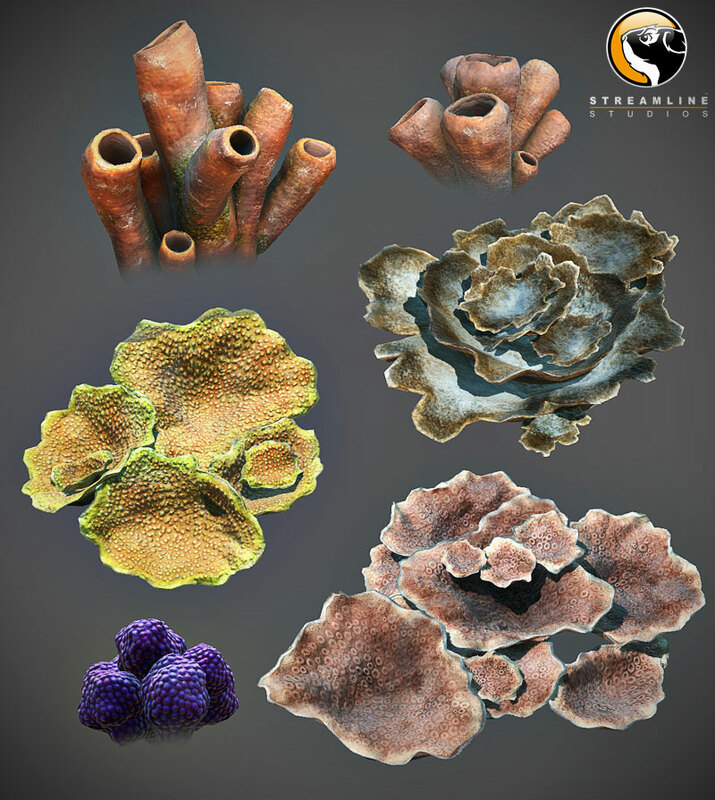 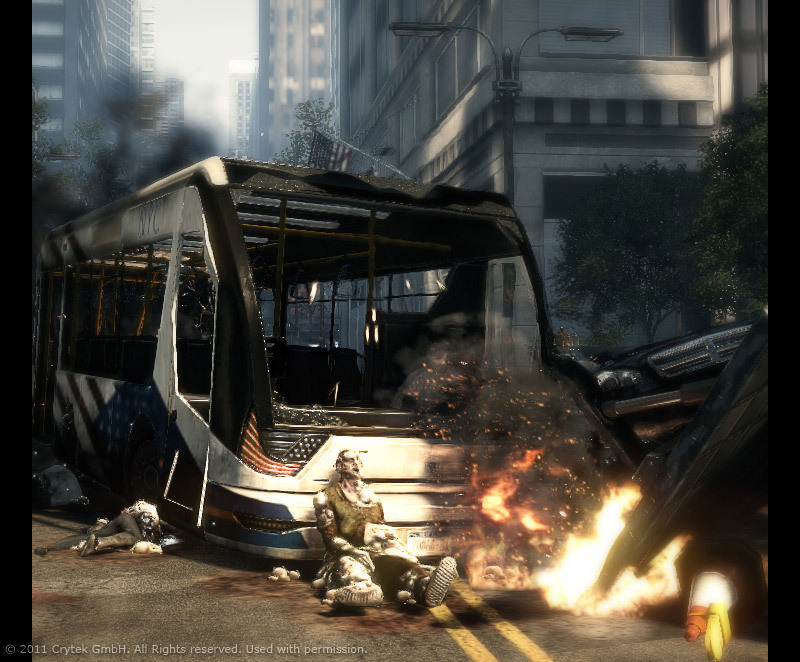 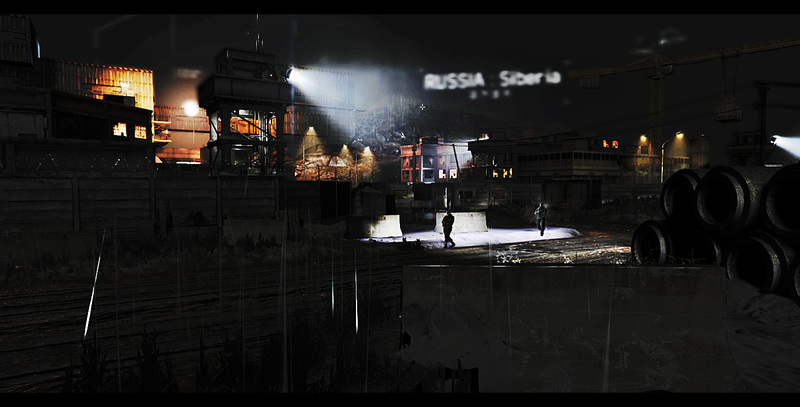 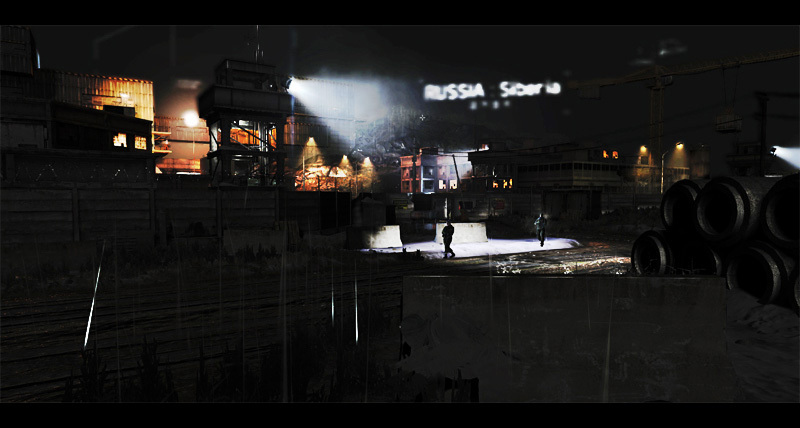 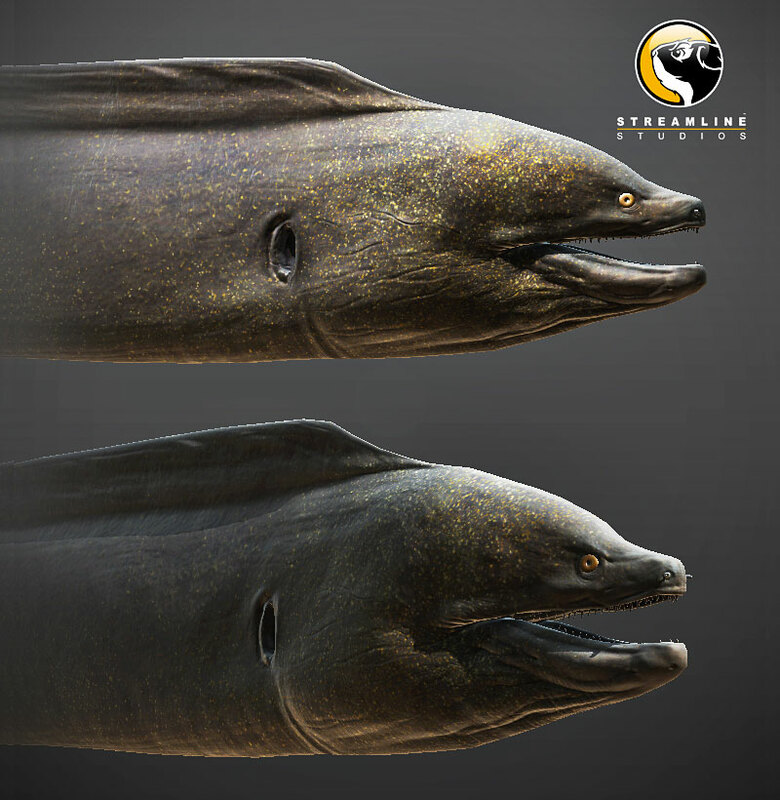 I and my team worked for several departements such as game design, level design, worldbuilding and cinematic. 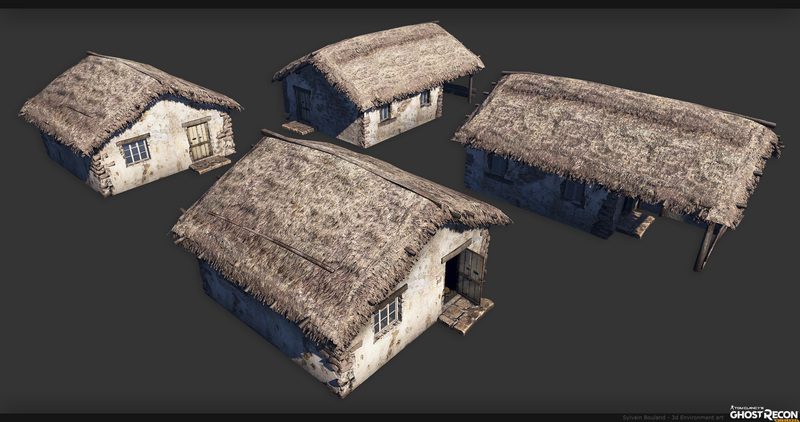 Beside, I worked as worldbuilder/level artist on two provinces up to final debug (Barvechos and Mojocoyo). 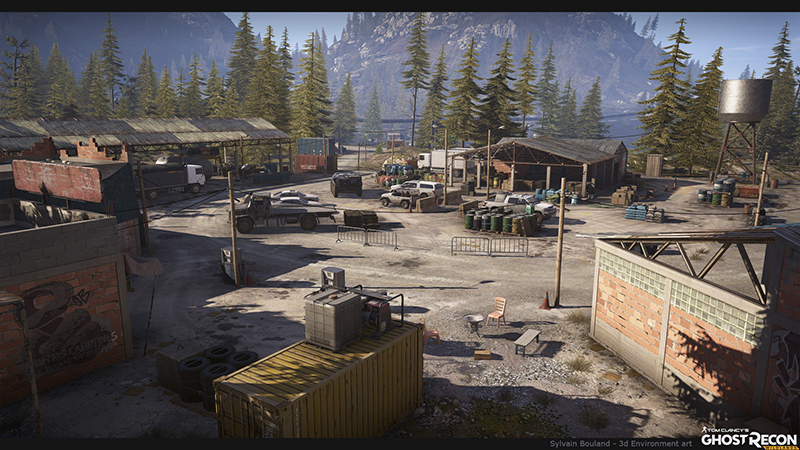 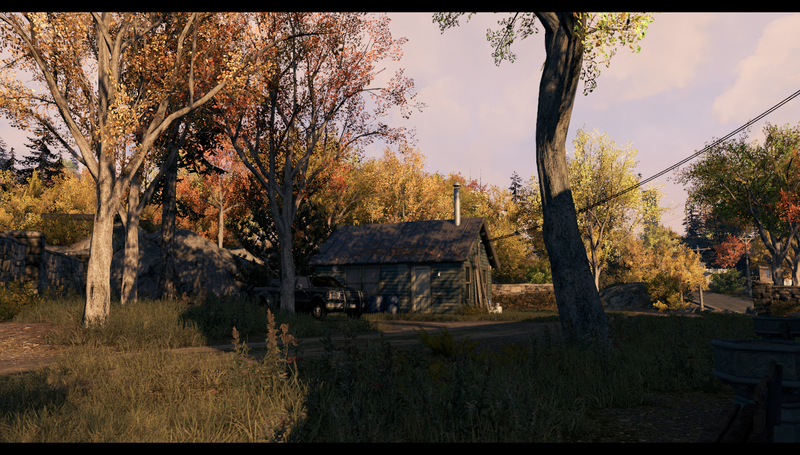 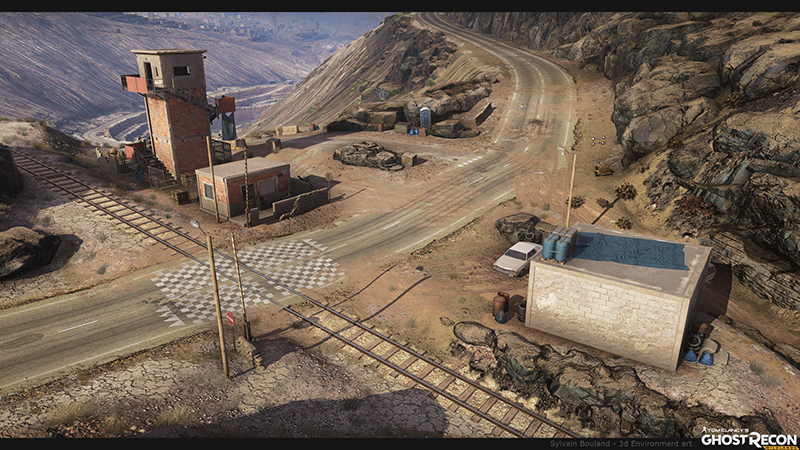 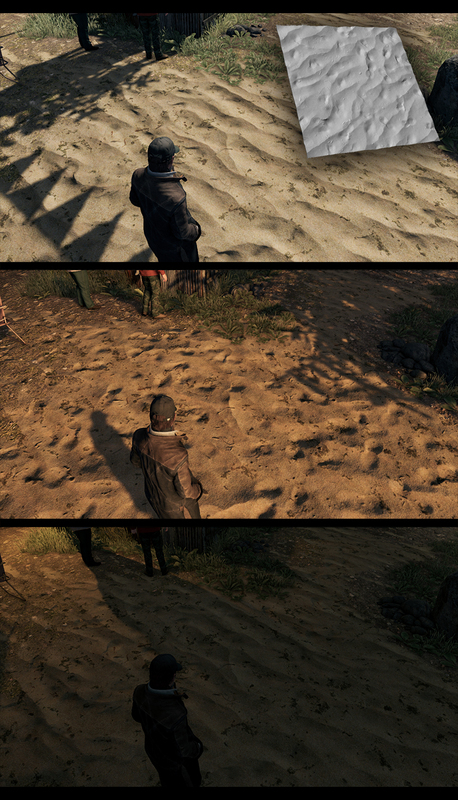 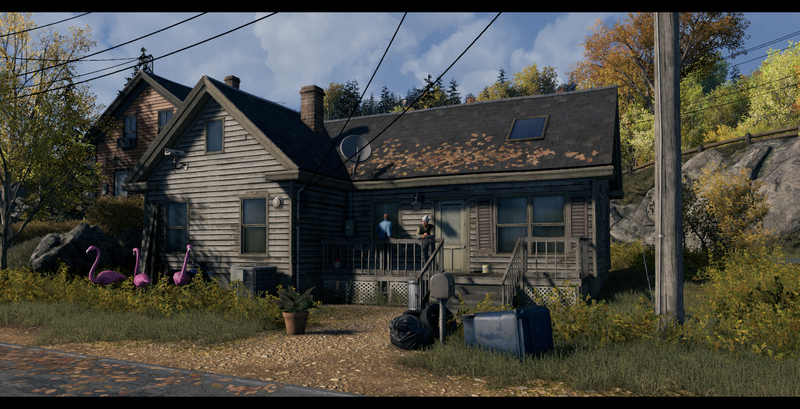 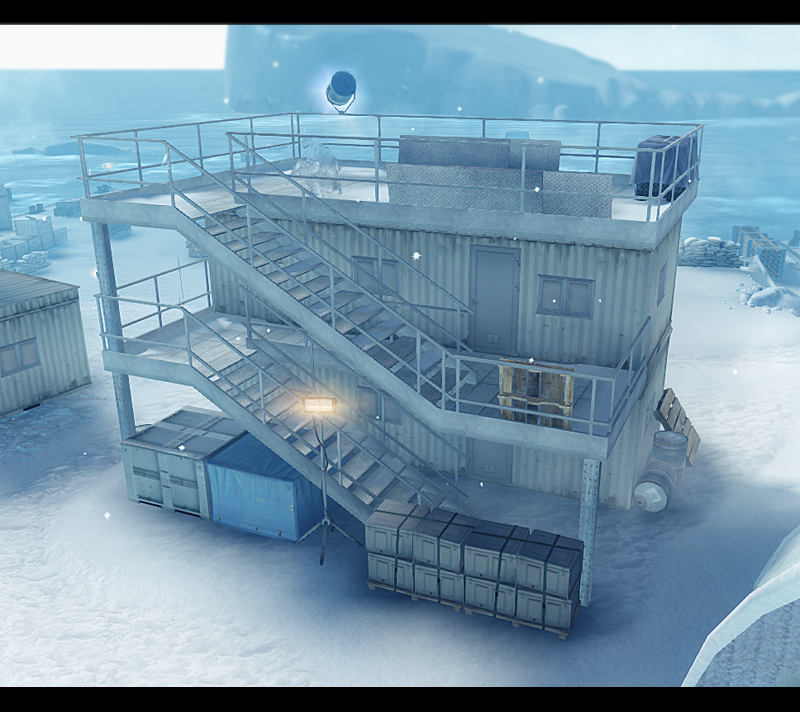 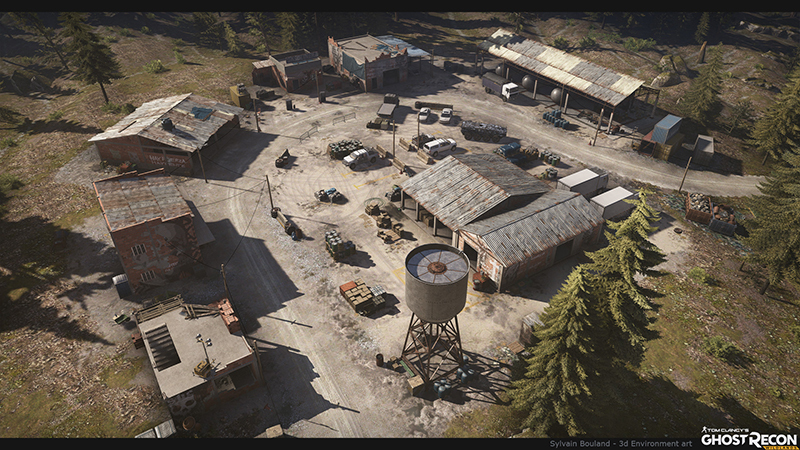 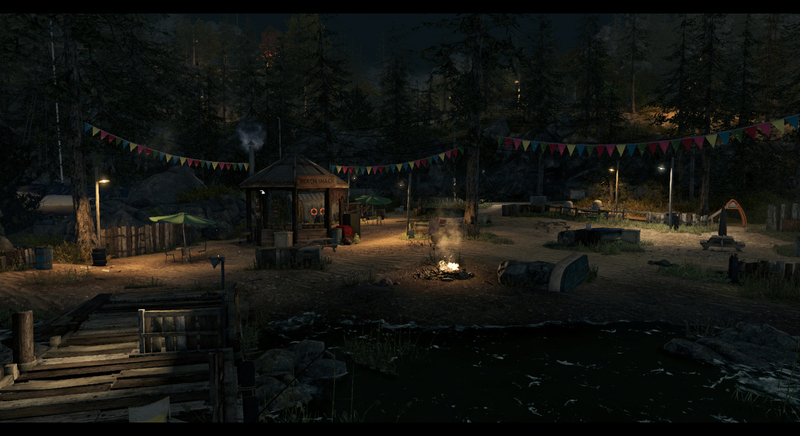 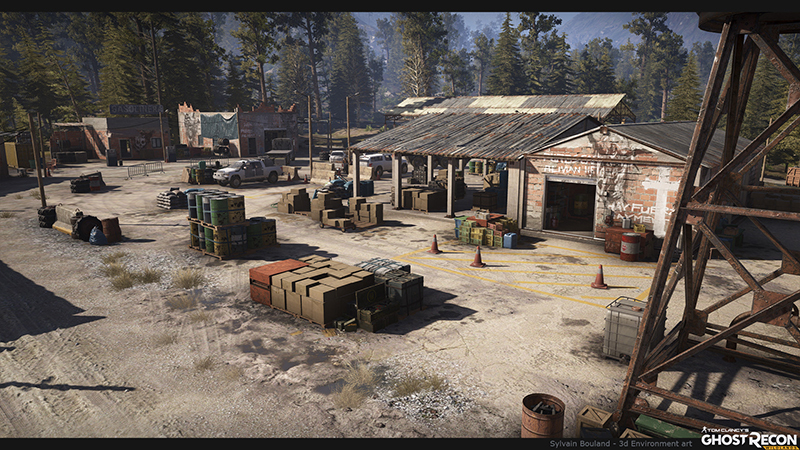 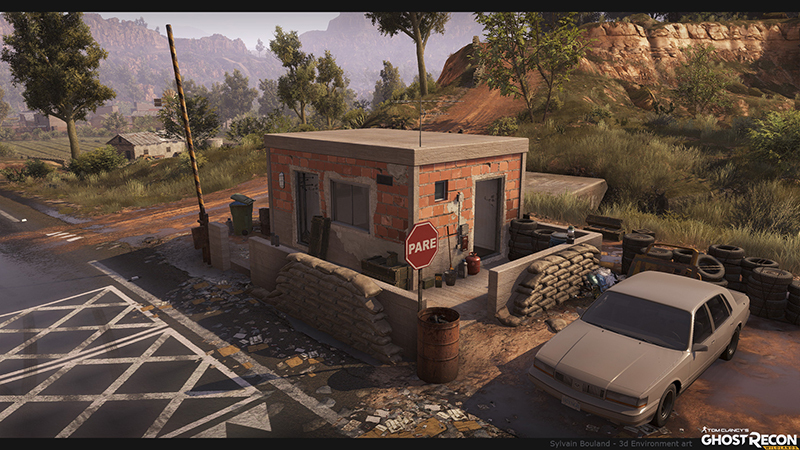 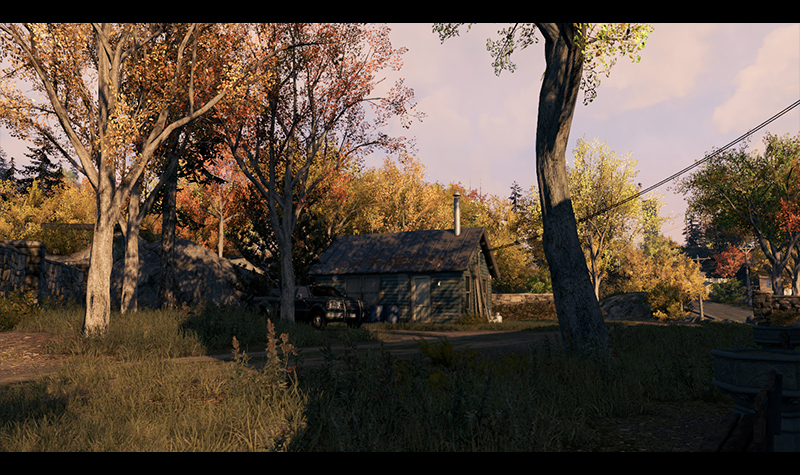 Most of the screenshots of outposts bellow are collaboration works between I, level artists and level designers. 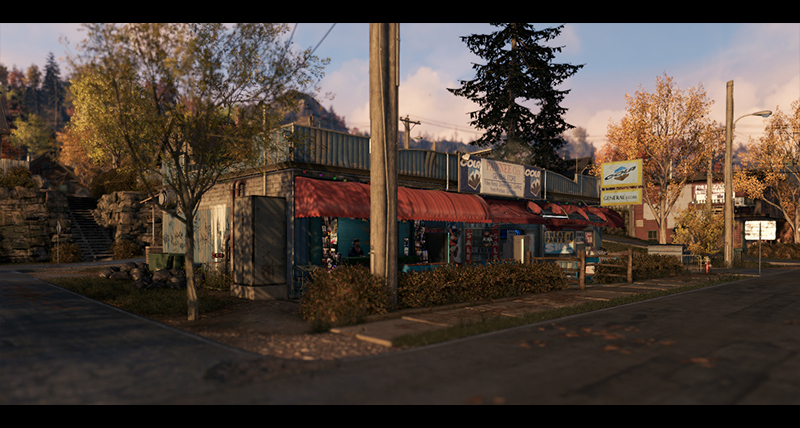 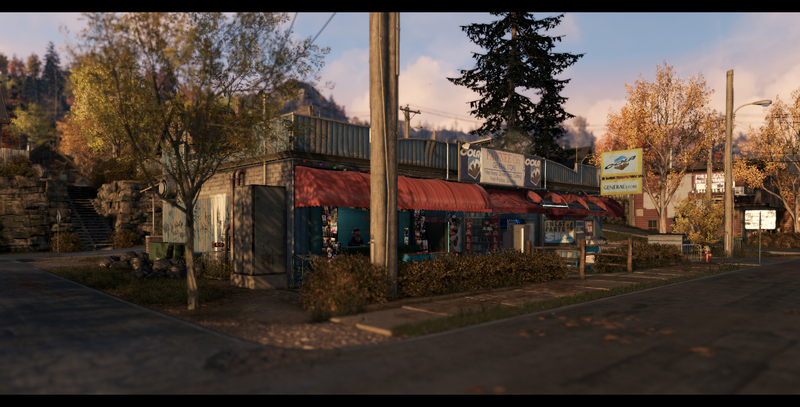 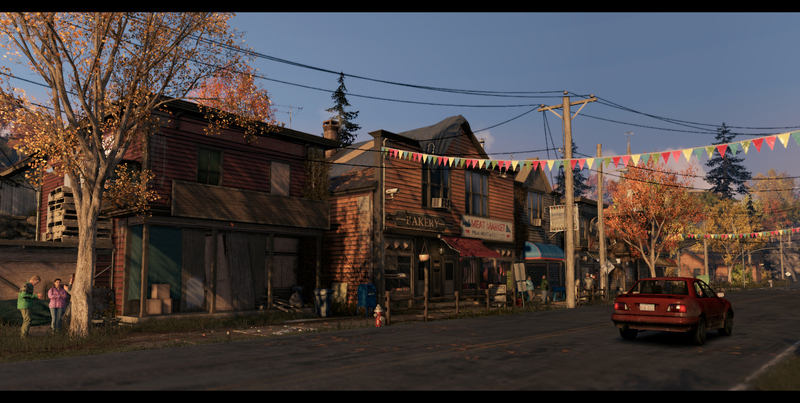 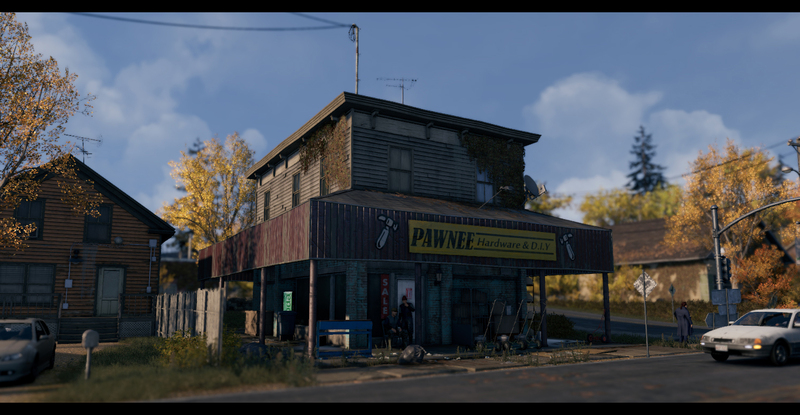 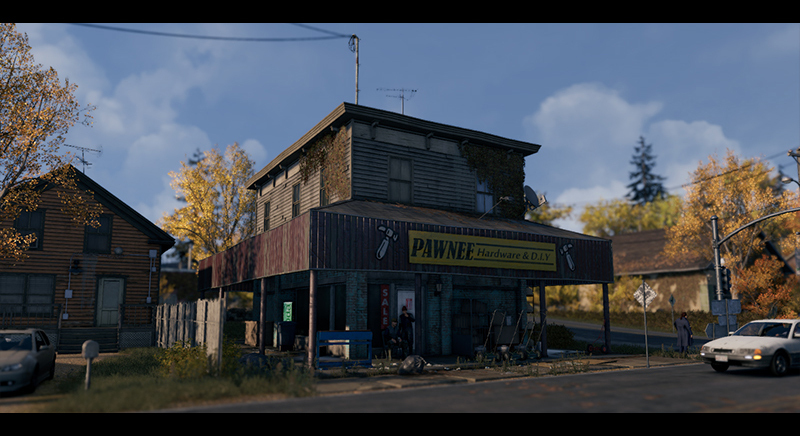 As a level artist, my main focus was to build up most of the village center in the Pawnee district. 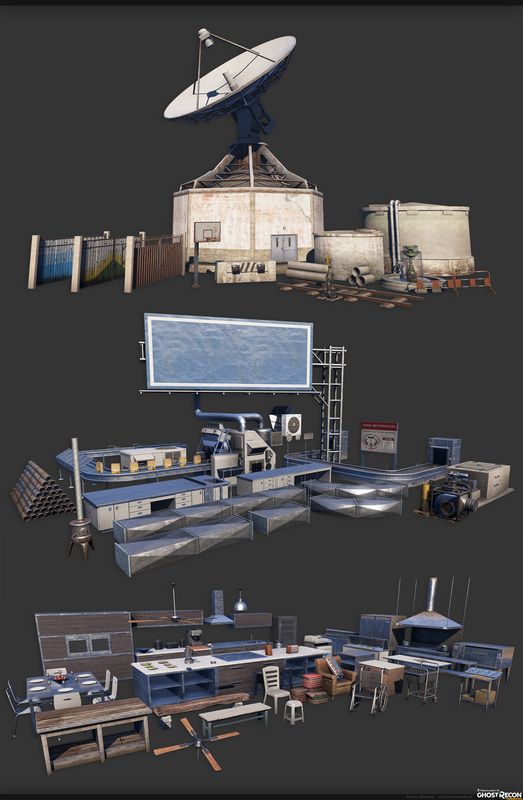 I had to make my own buildings and props while re-using various assets made for the entire game. 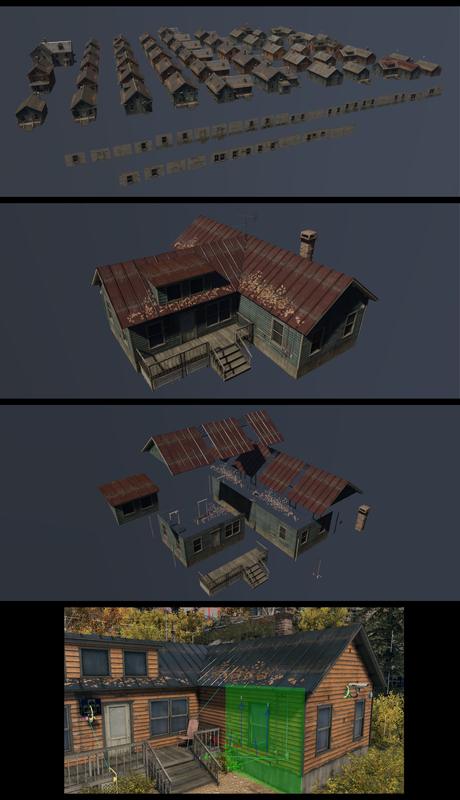 From early prototyping to final integration and debug, I worked with other departments such as Level designers and mission designers to maintain a smooth navigation for the player. 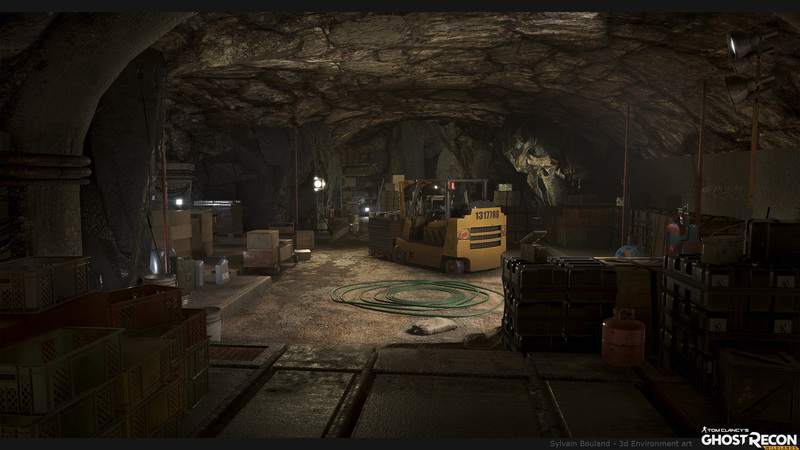 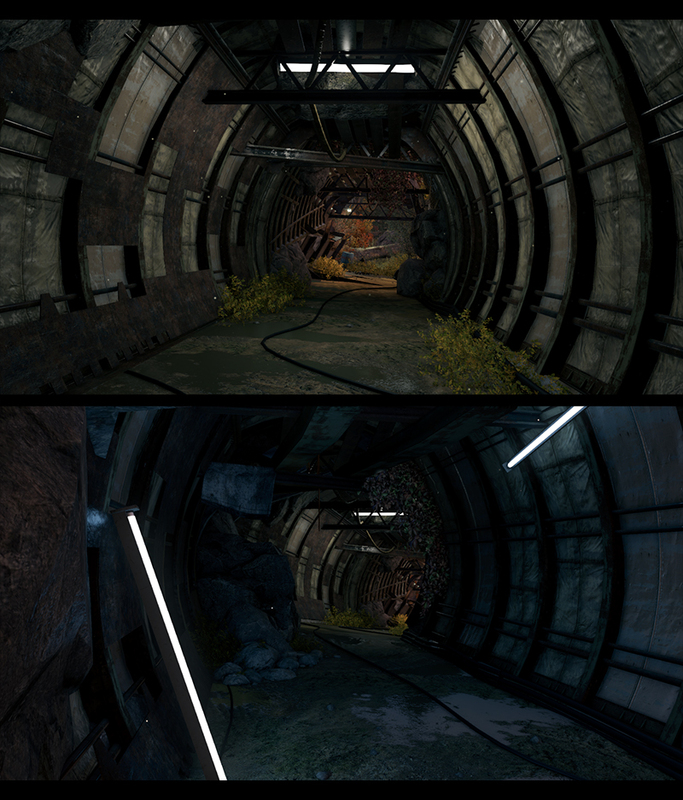 I also polished other areas and worked on other parts of the district as a support artist - for - the Junkyard tunnel, the Pawnee beach, the road tunnels, the graveyard and the main Blume building. 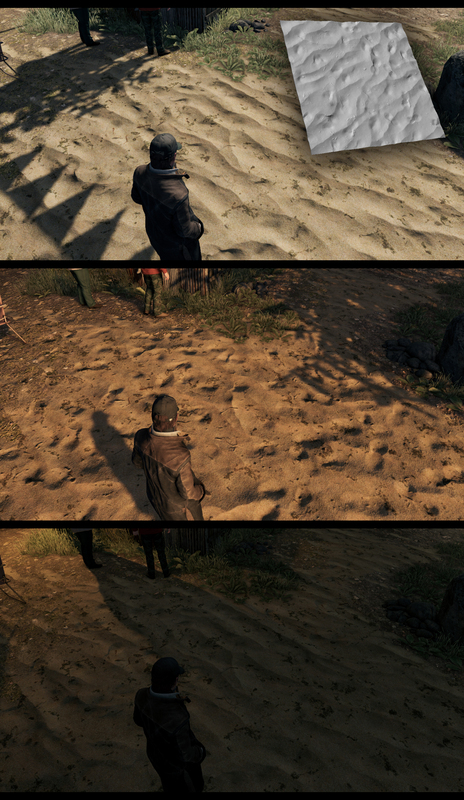 I also helped a little with off-road areas (ground painting, placing rocks and trees. 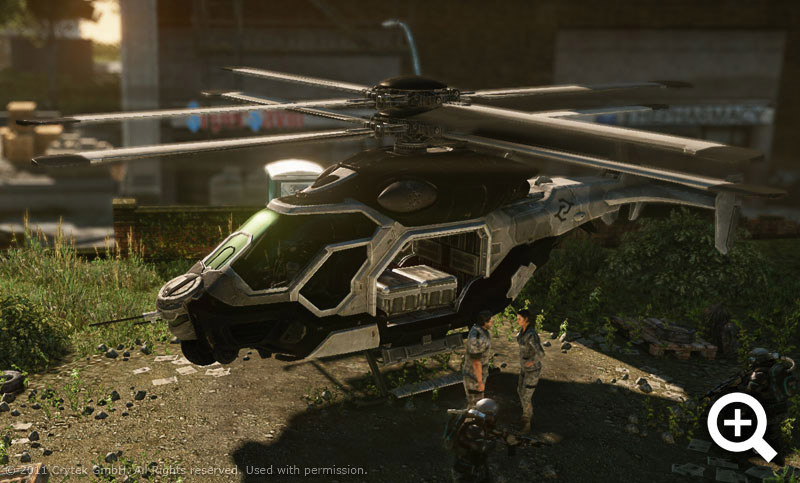 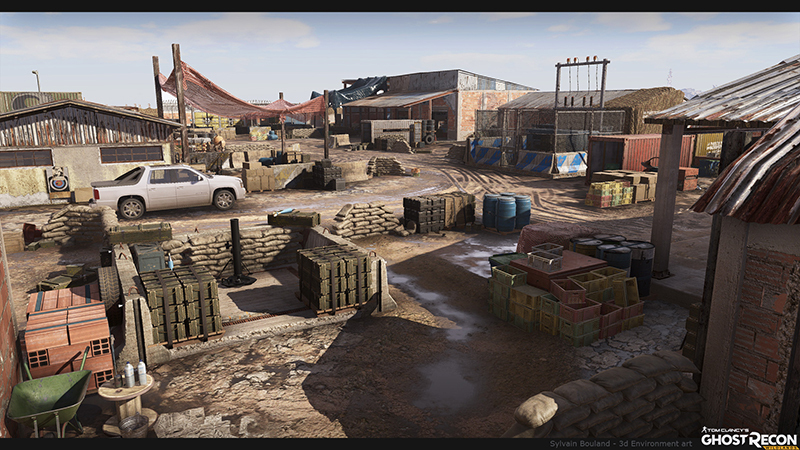 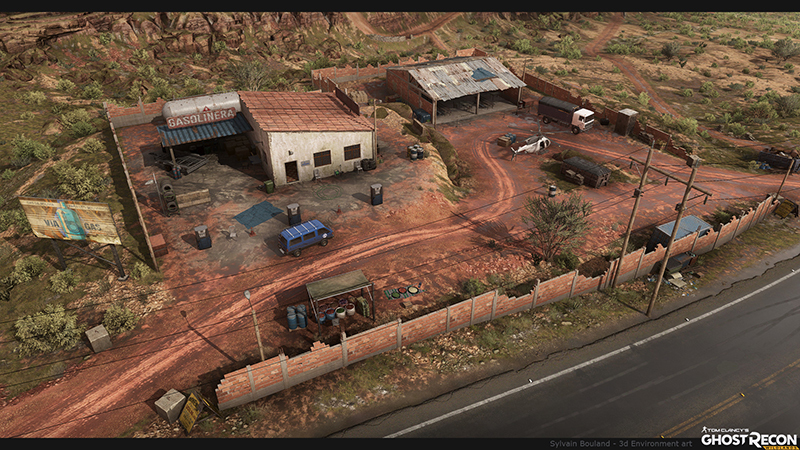 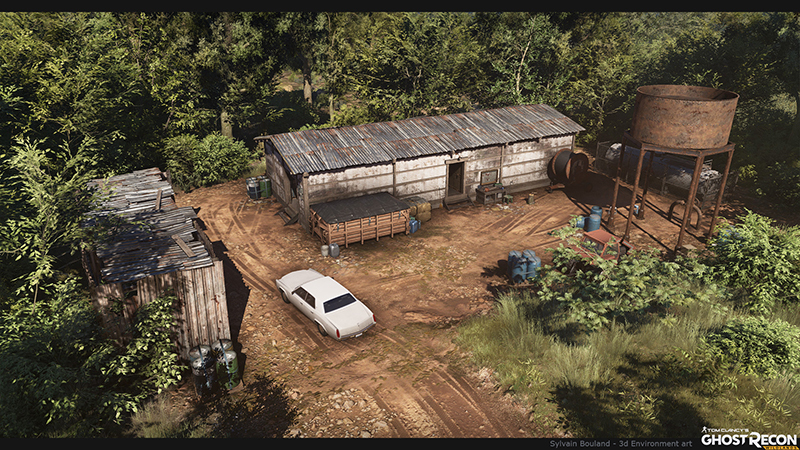 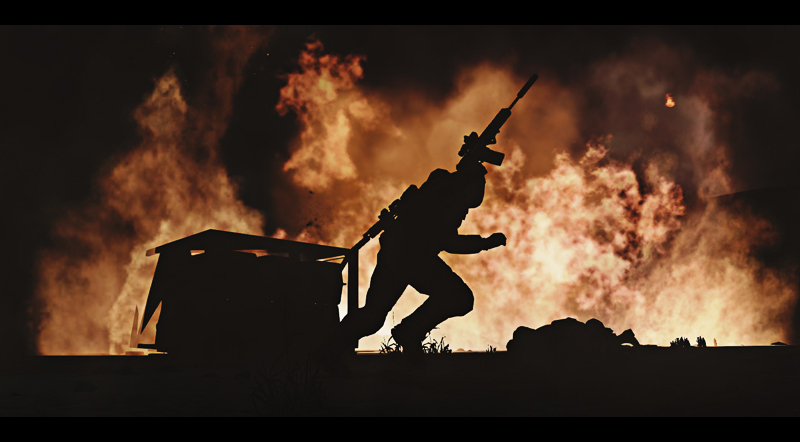 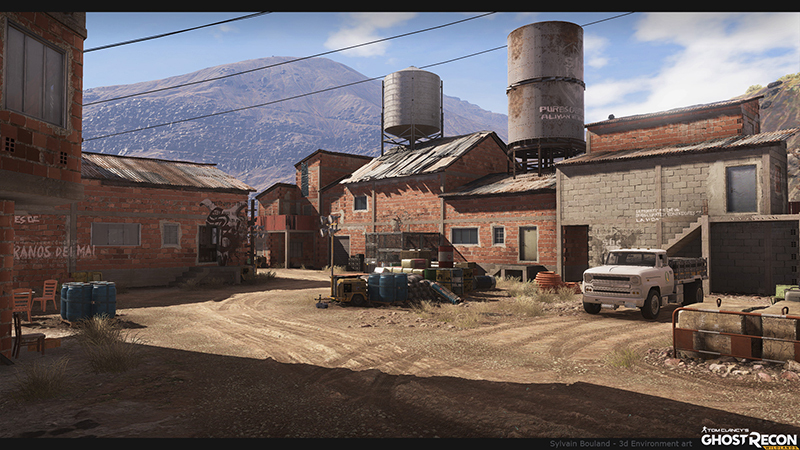 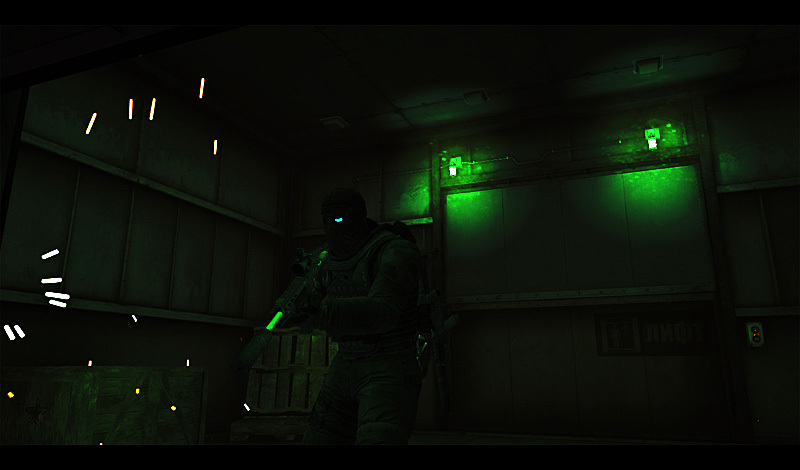 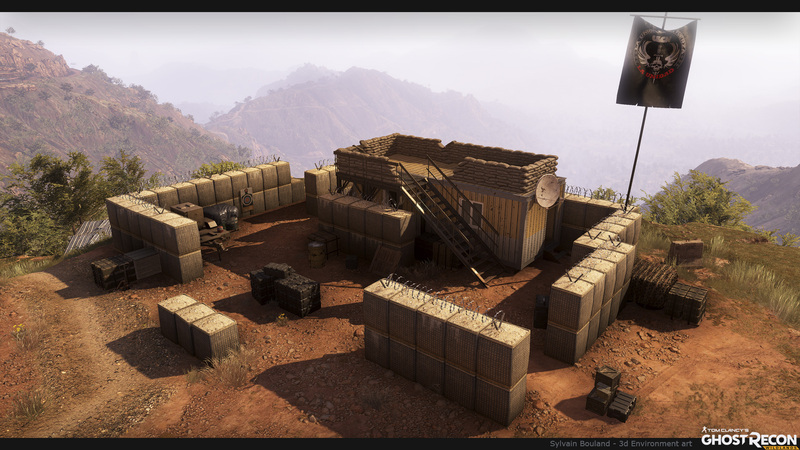 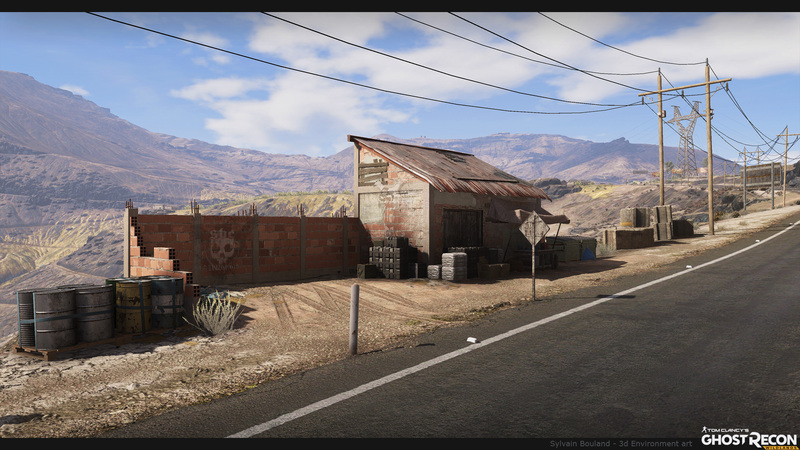 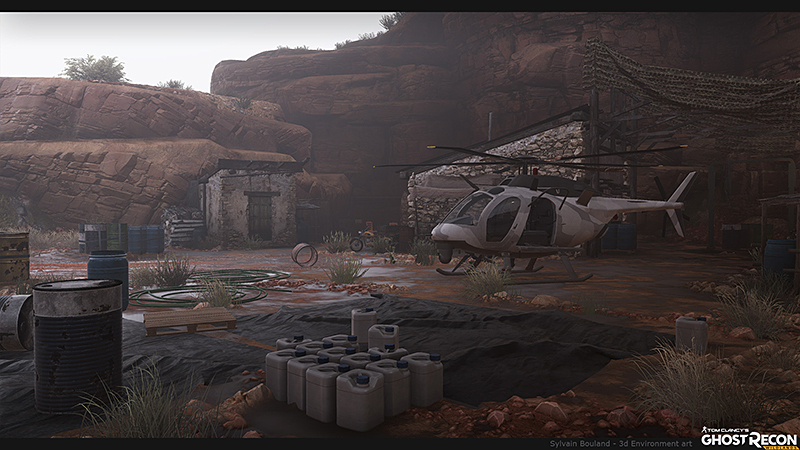 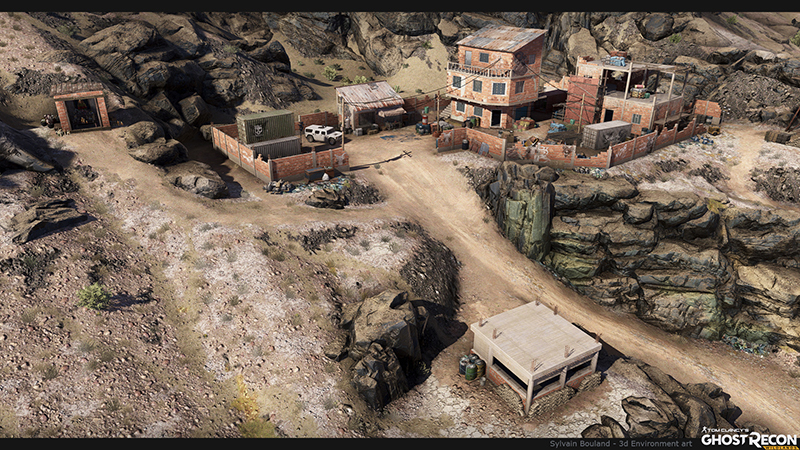 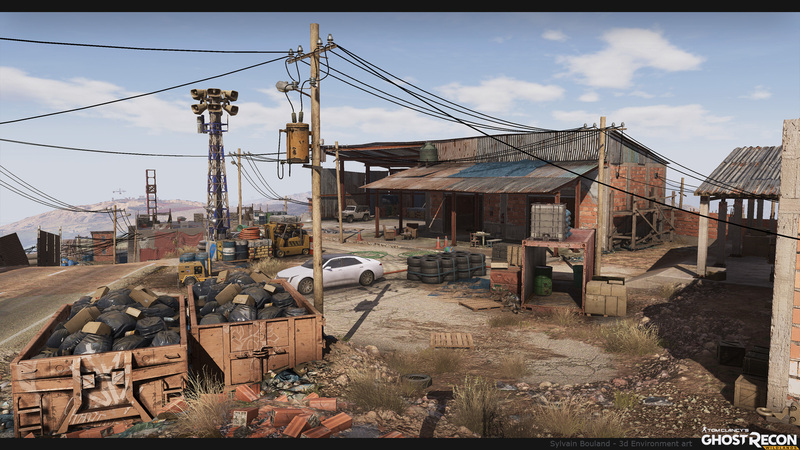 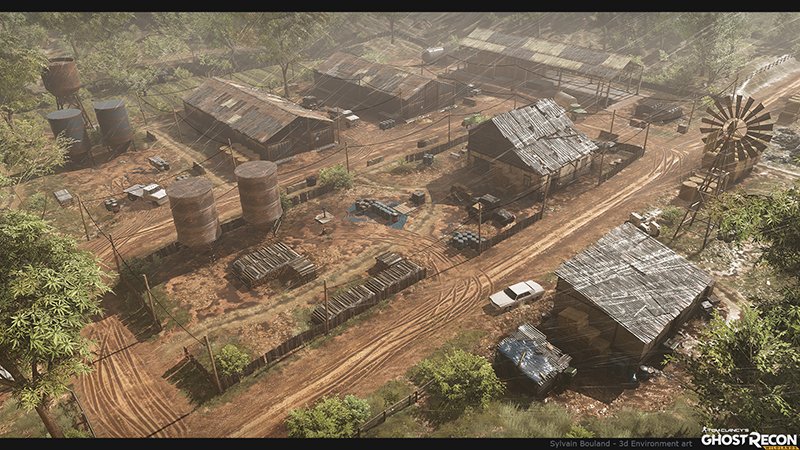 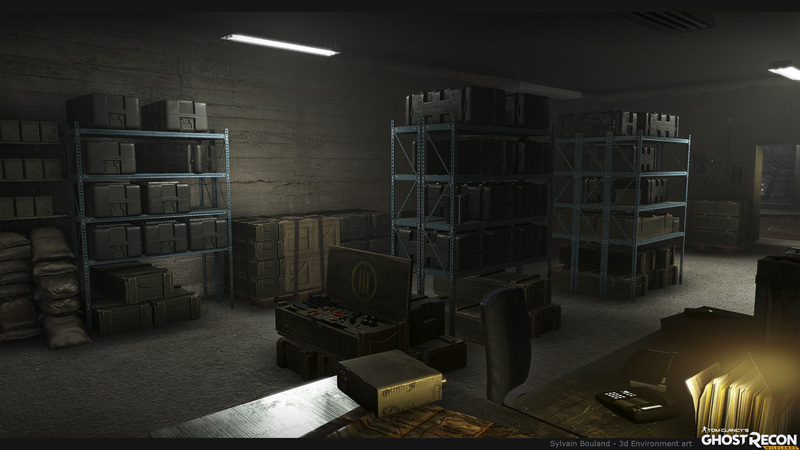 On Ghost Recon Future Soldier, aka GRFS, my main responsability as Level artist was to dress up a level of the campain completely from scratch based on Jean Zappavigna's work, the level designer and my main partner in this adventure, from early prototypes to the debug process period. 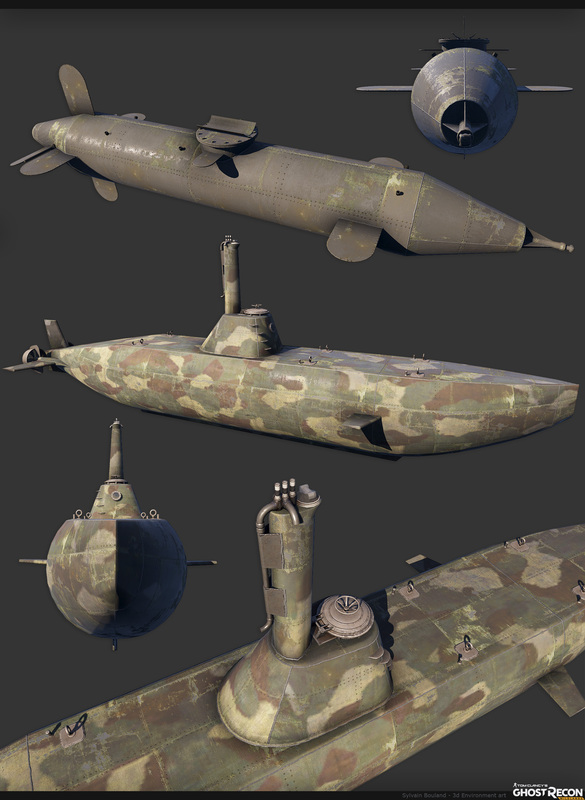 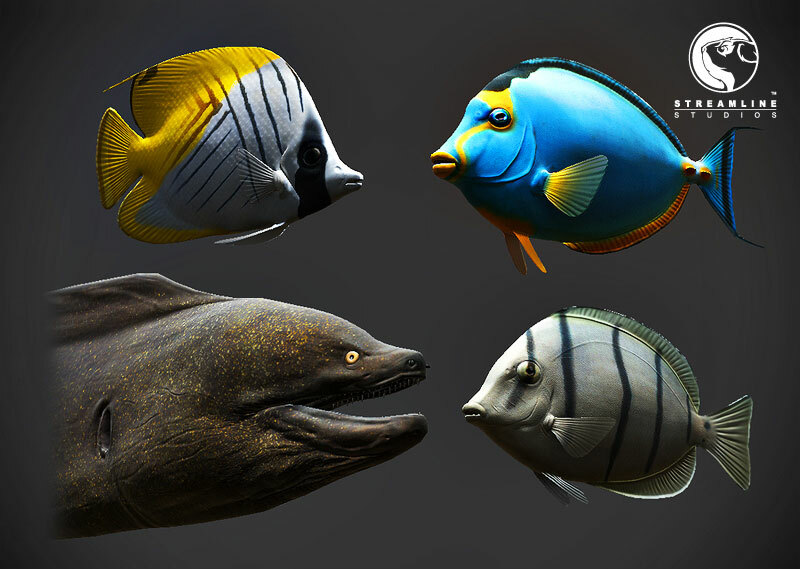 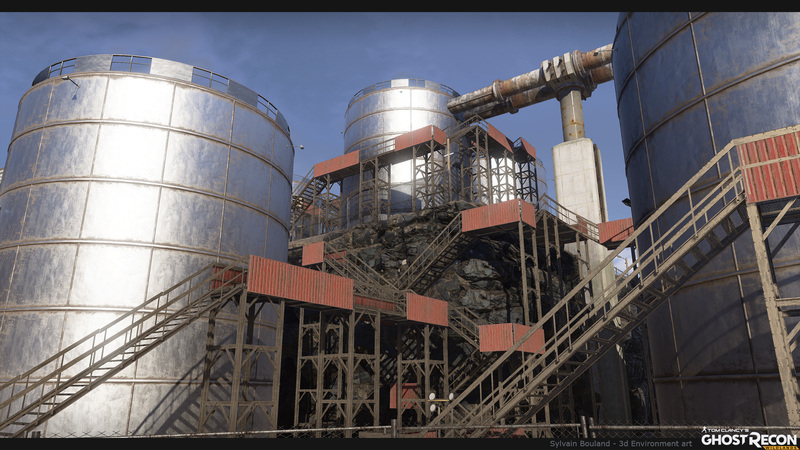 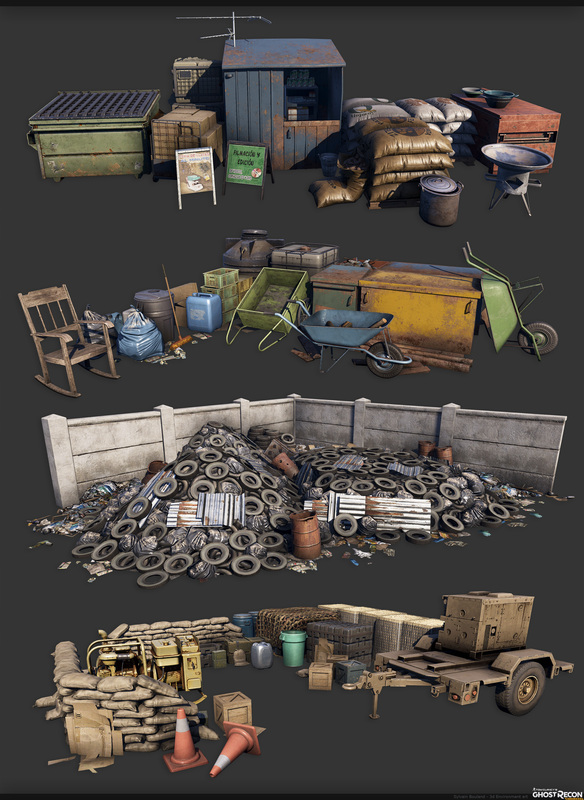 I made my own models and textures but I've have also re-used various props, especially cover objects available in the global asset library made by several artists at Ubisoft for the entire game. 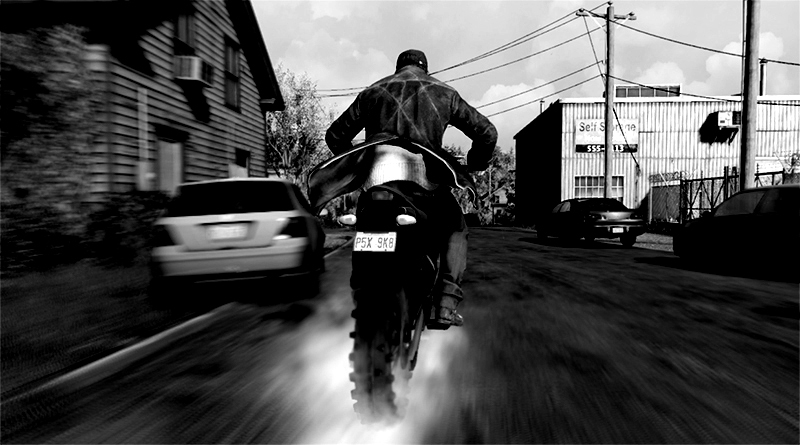 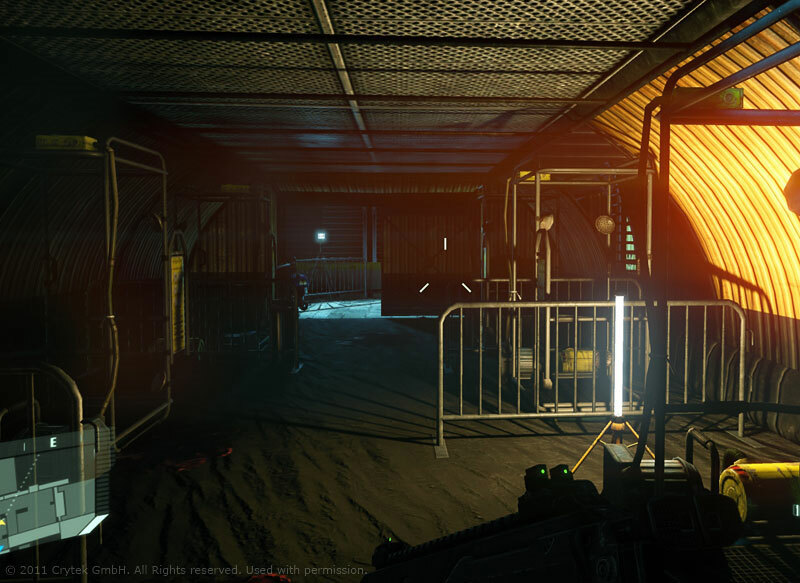 This mission, code named 'Gallant Thief', is about 45 minutes long for a first time player. 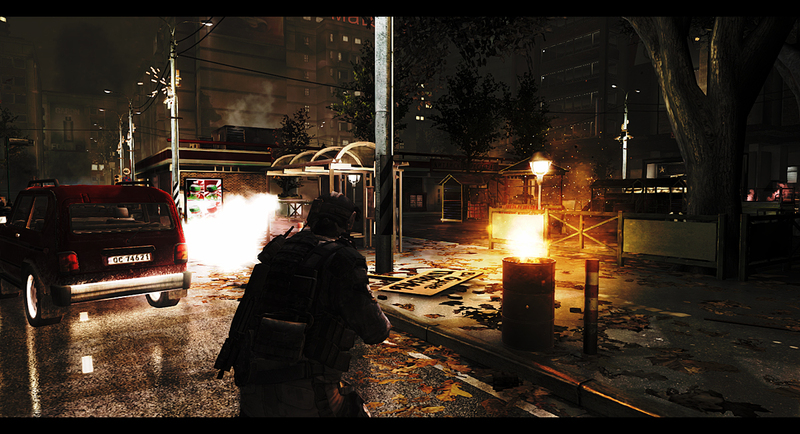 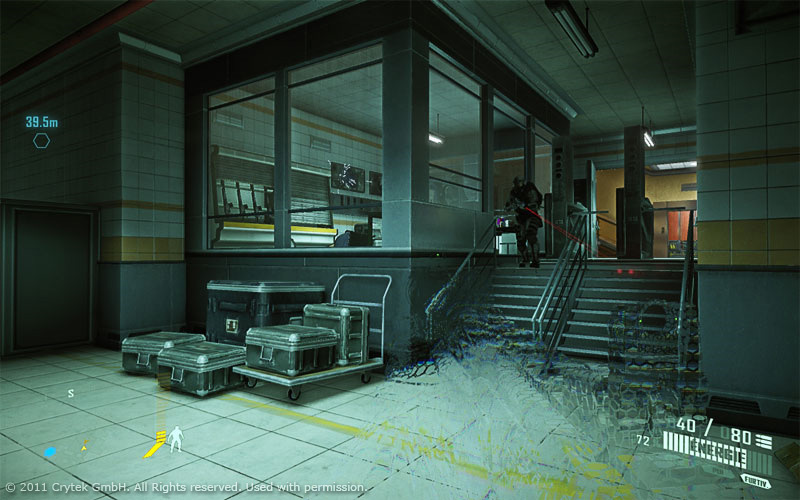 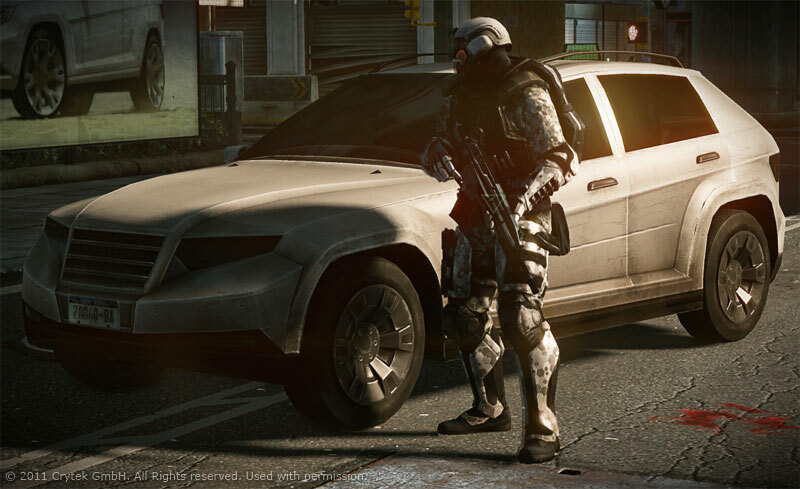 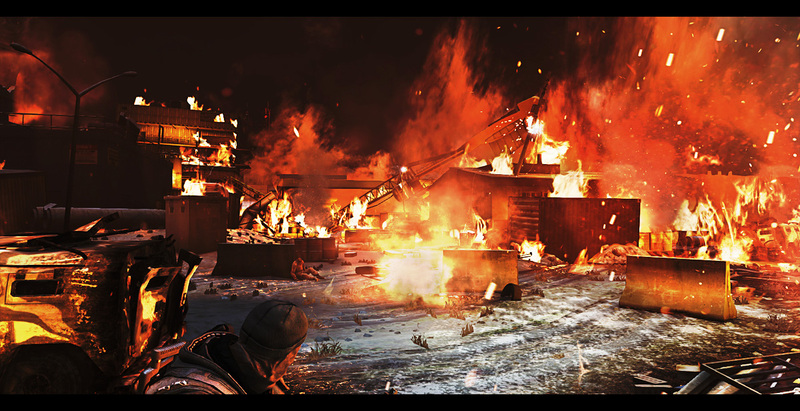 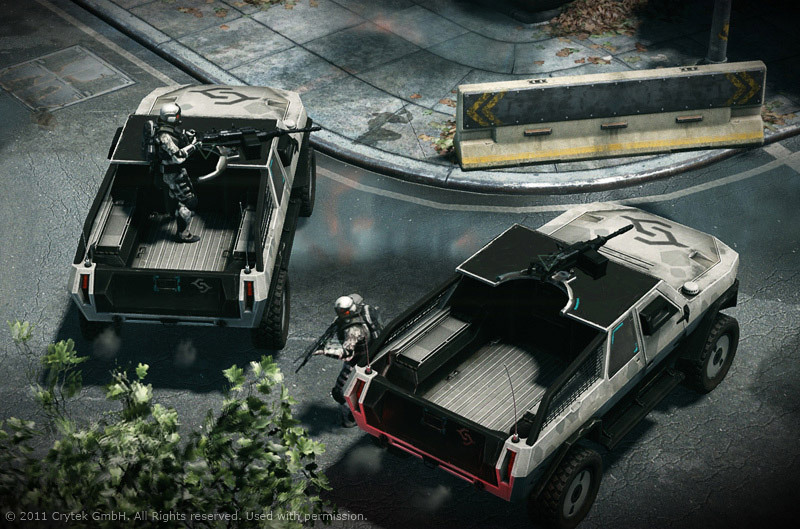 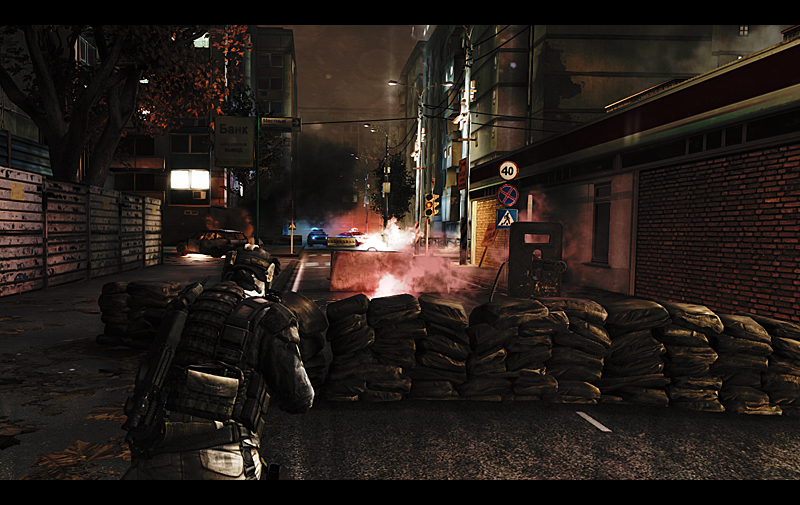 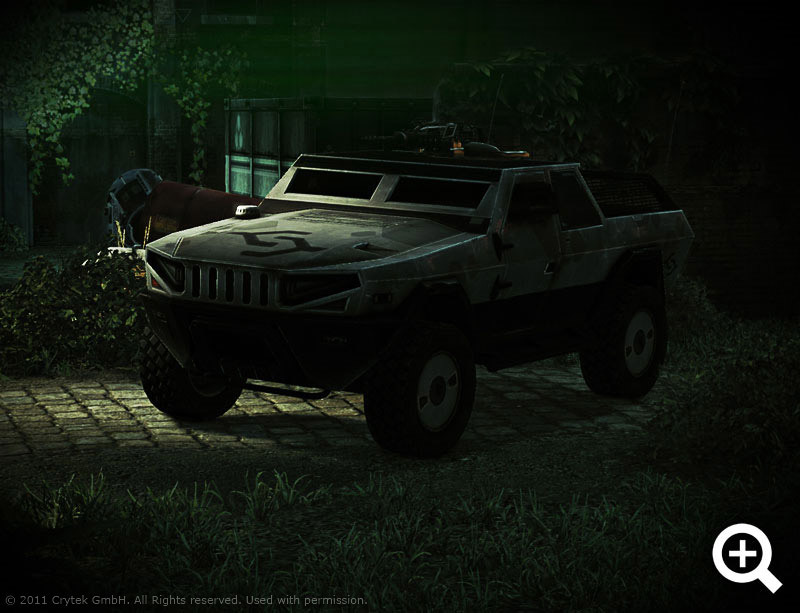 It is mainly infiltration gameplay oriented which will please the fans. 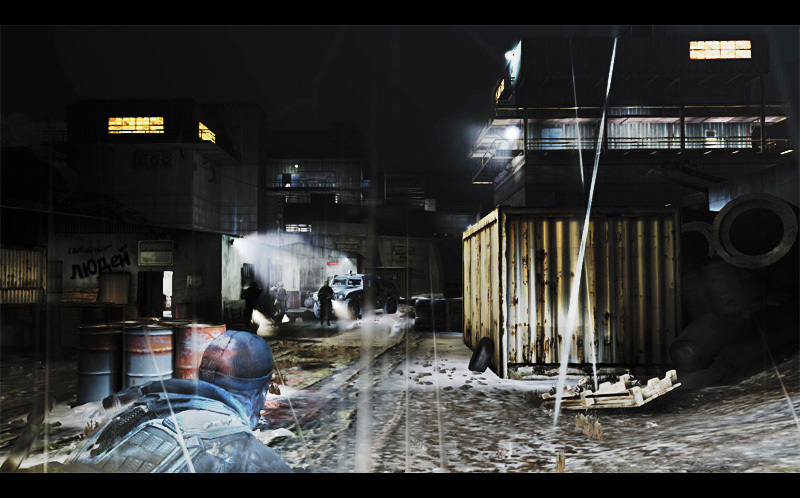 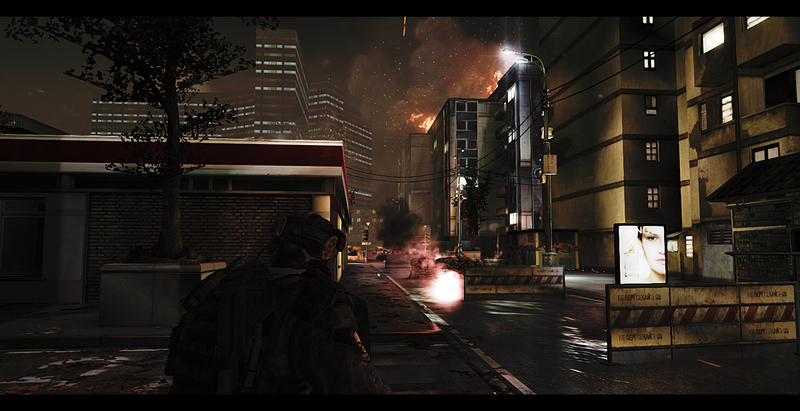 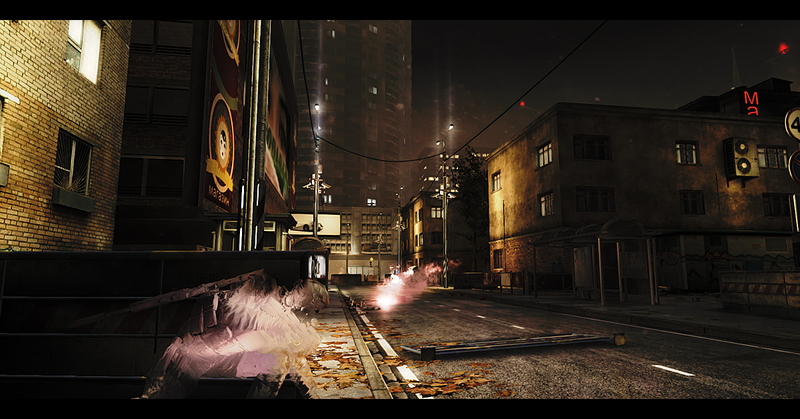 I would like to thank Fabian Nowak for his awesome job on the FX side (rain, fire, particles etc.) 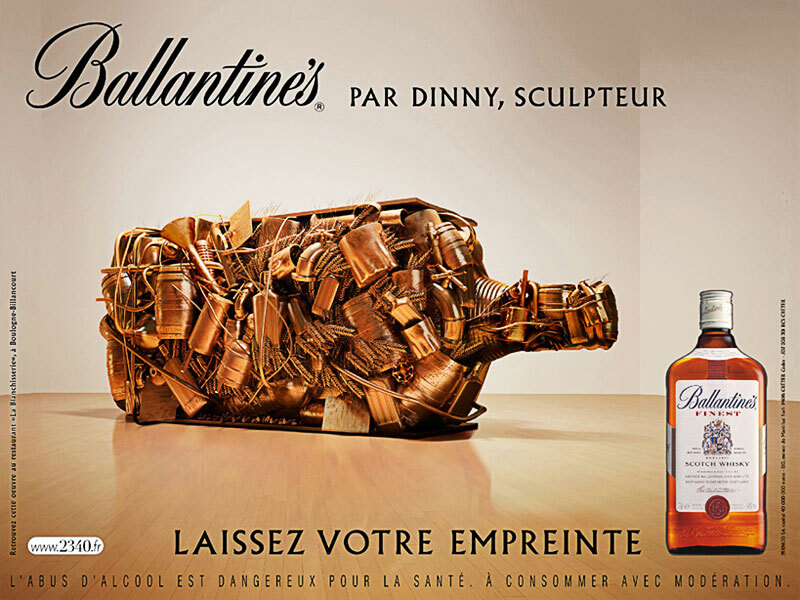 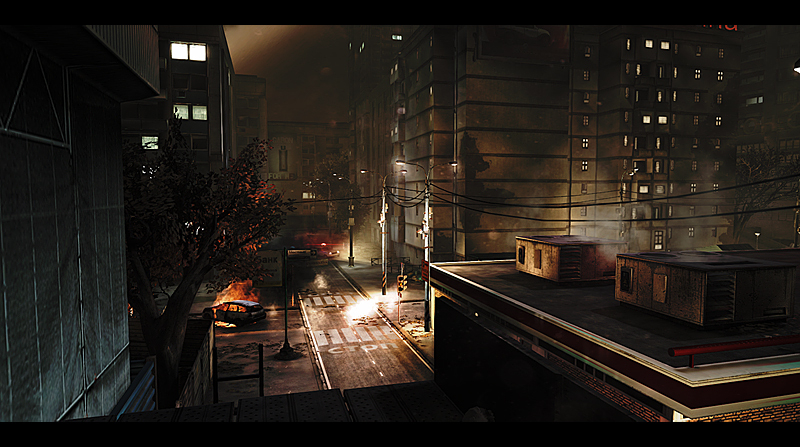 and Denis Mercier for his nice touch with his lighting. 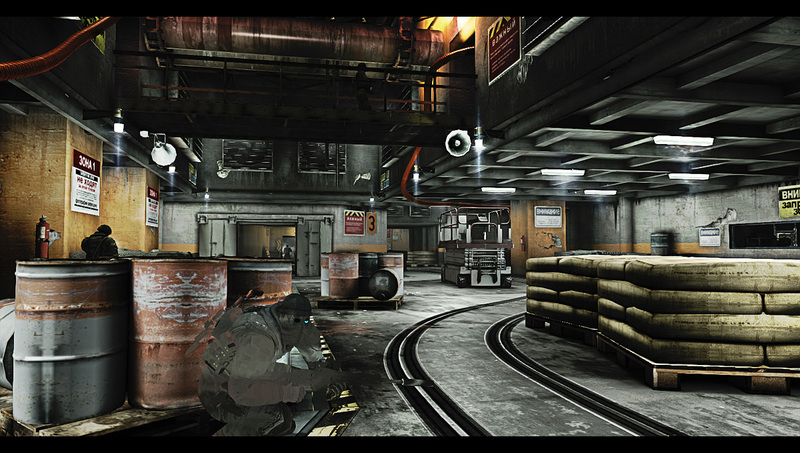 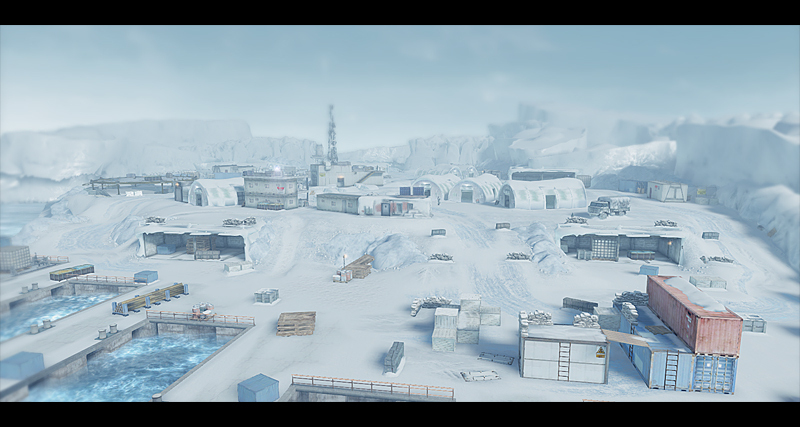 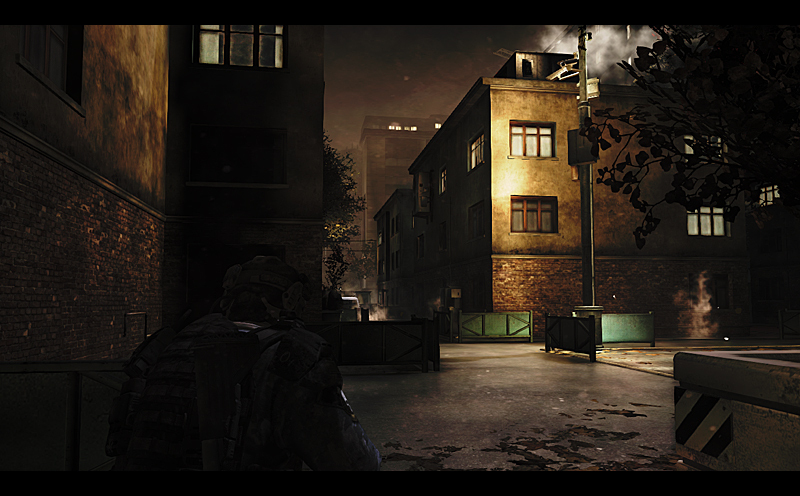 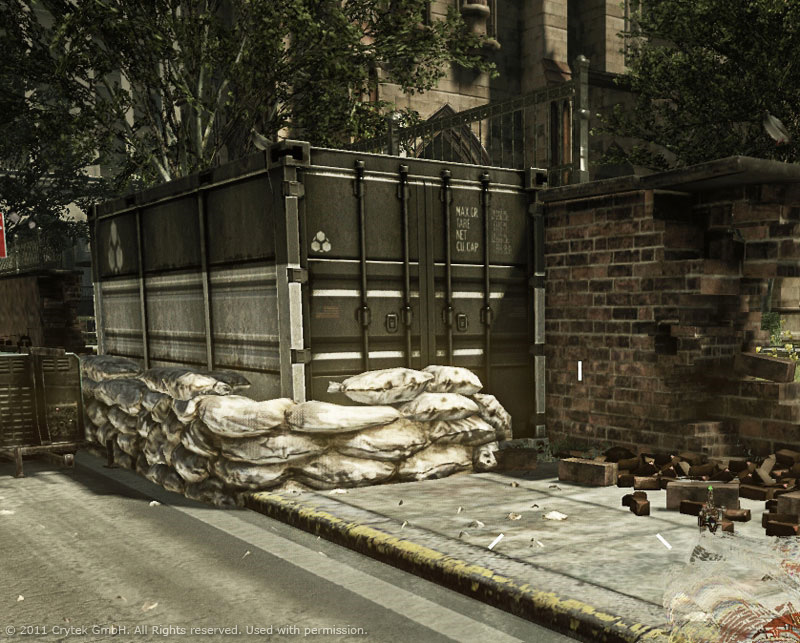 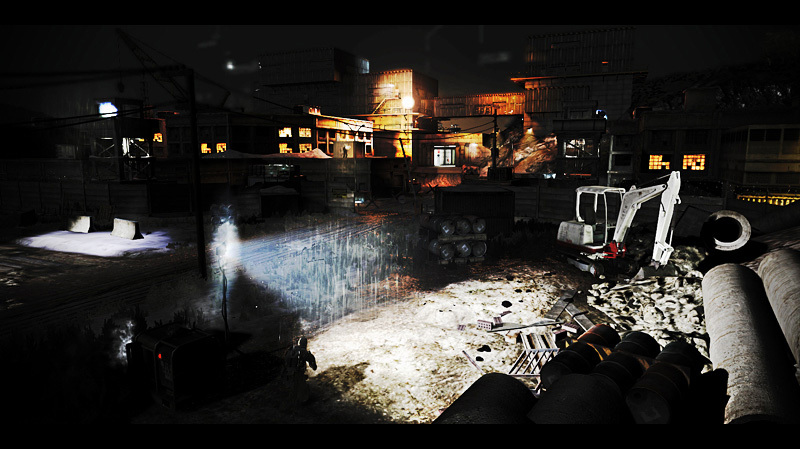 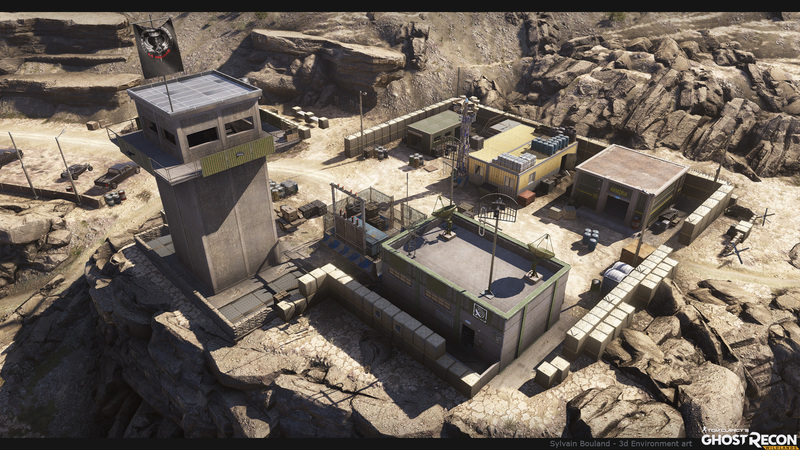 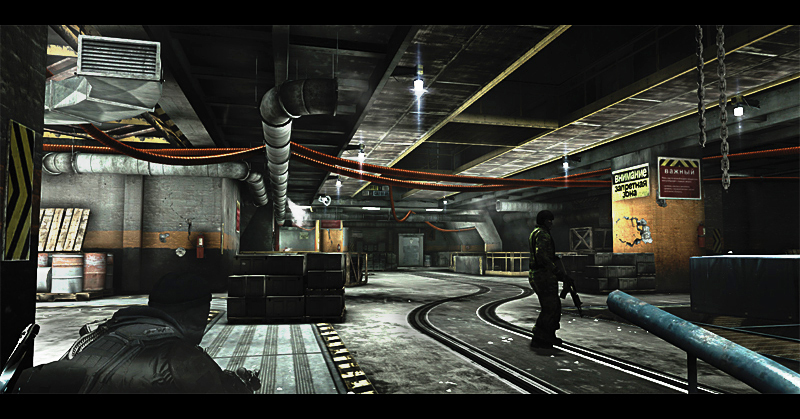 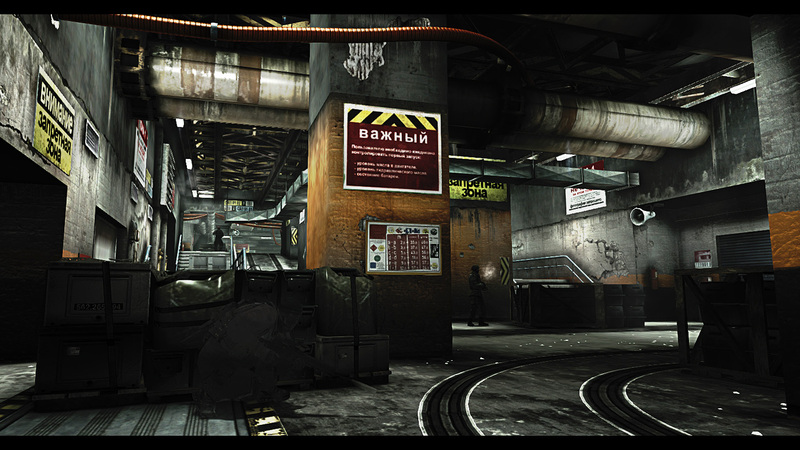 Bellow you will see complete walkthroughs of the map performed by good gamers. 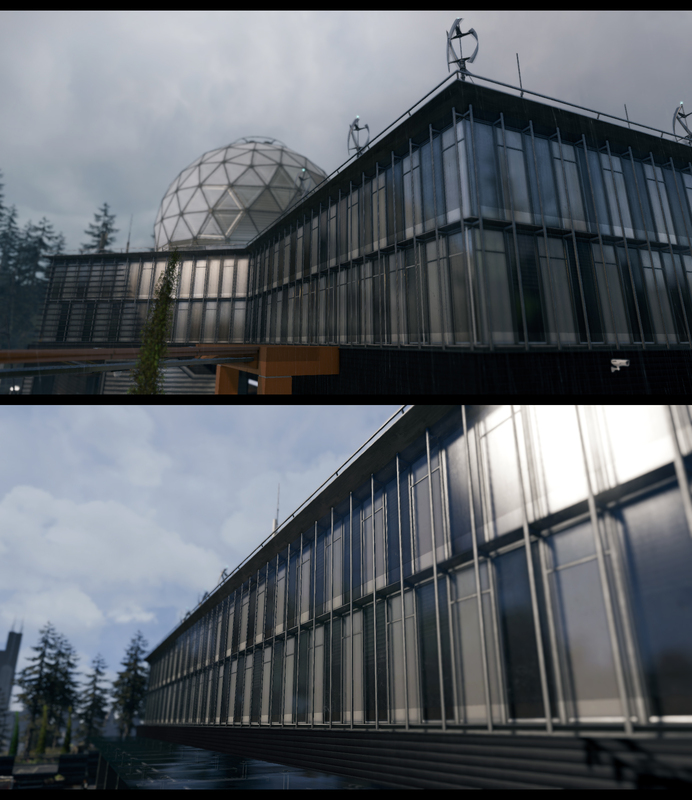 It pleased my colleague and I and so I wanted to share the videos. I've also put various screenshots in addition. 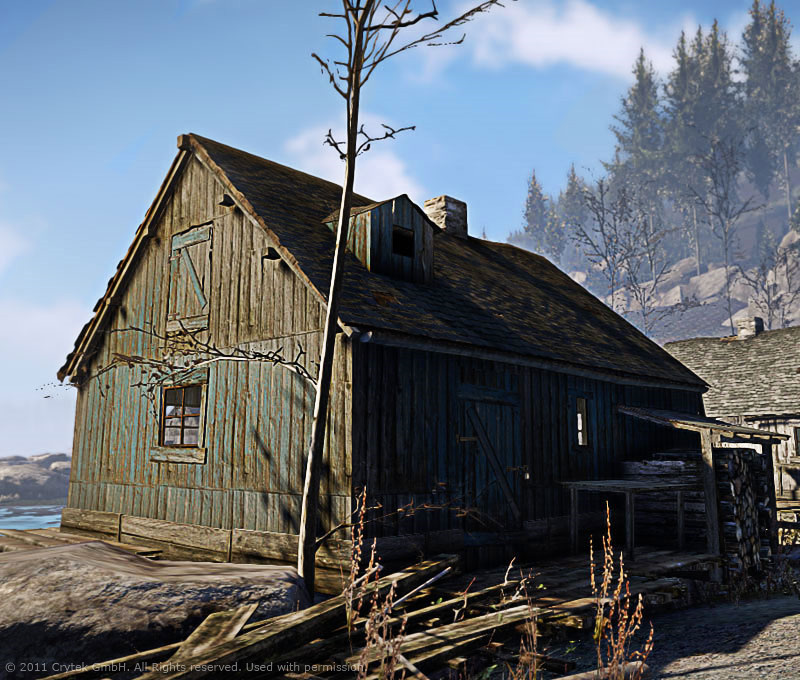 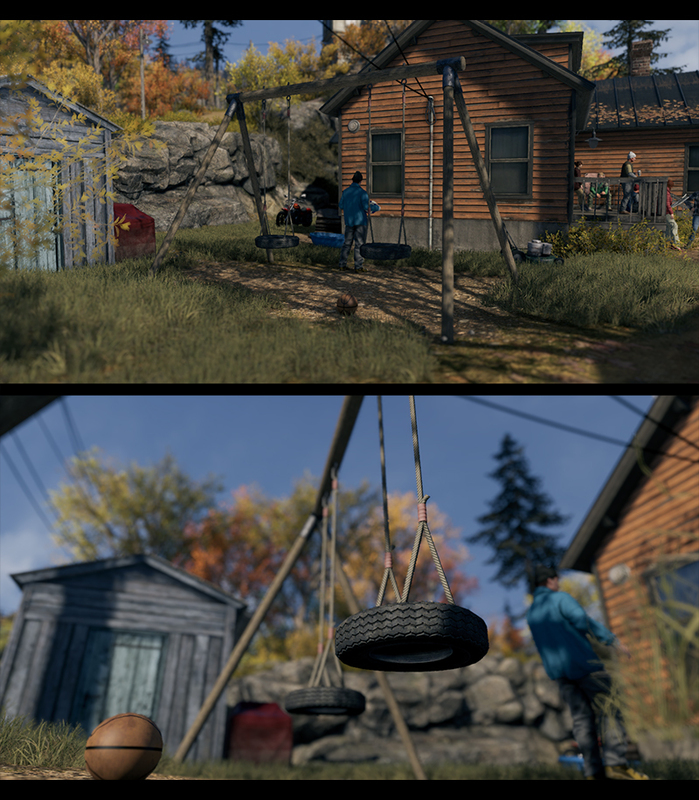 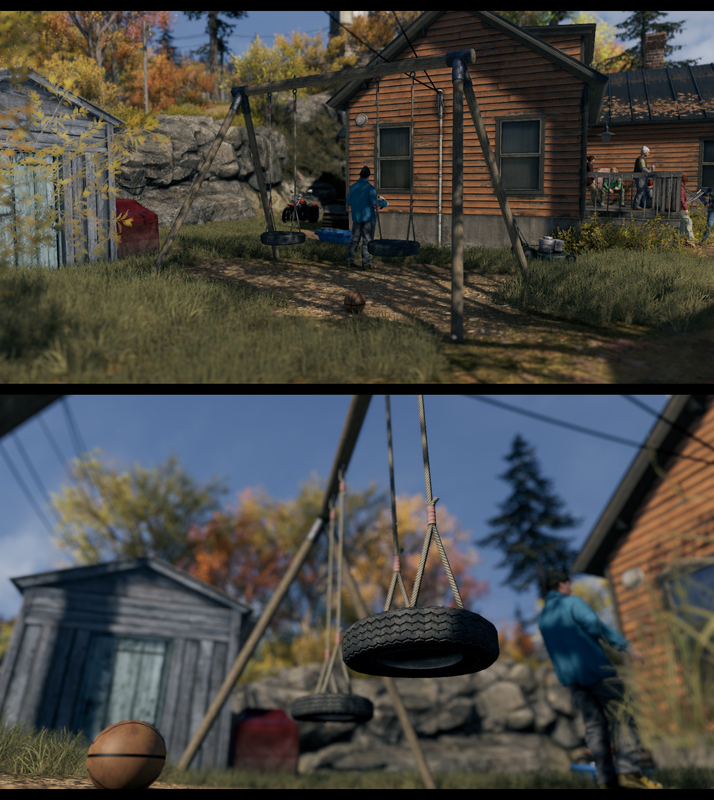 I have done this fishing house + modular pieces, including modeling, texturing and material setting. 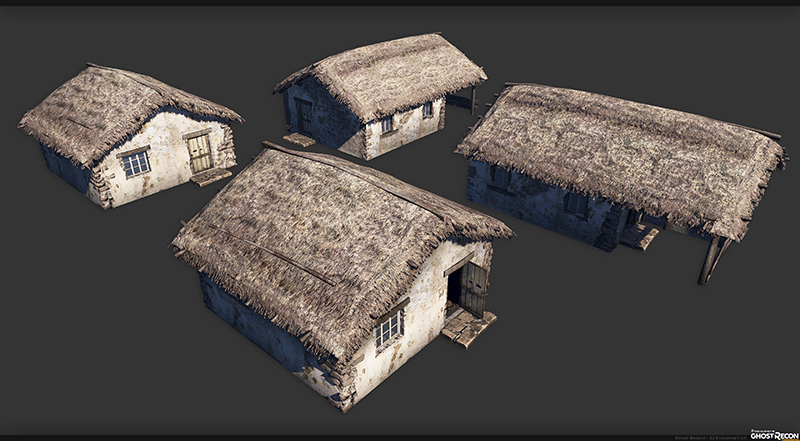 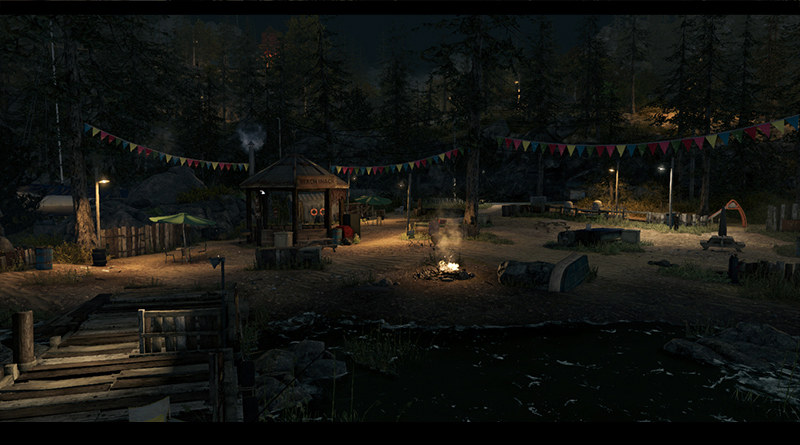 I have done this fishing house + modular pieces + wooden barrels, including modeling, texturing and material setting. 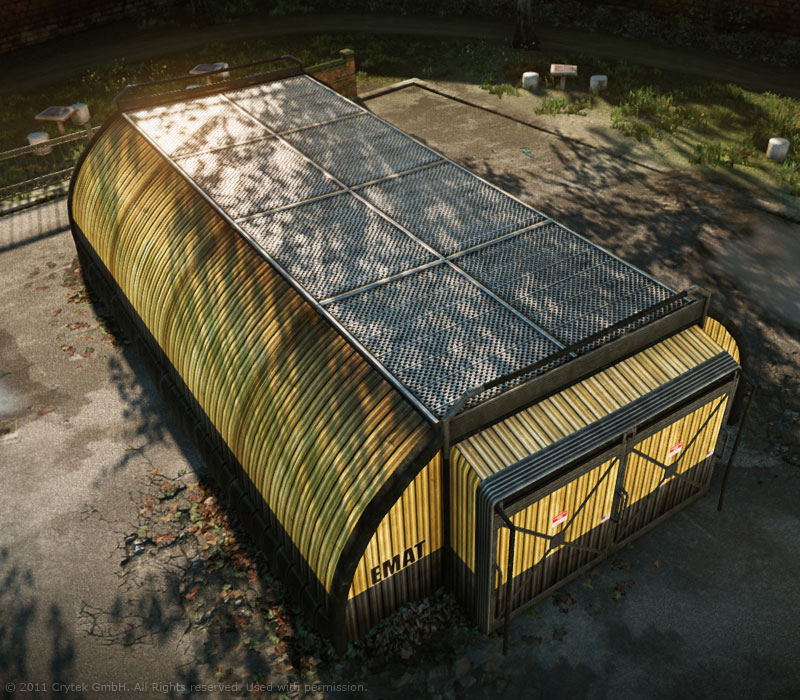 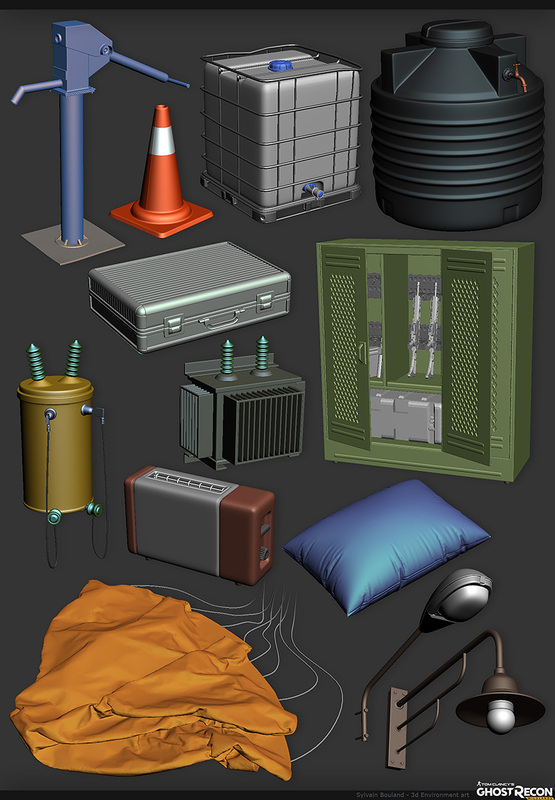 I have done the EMAT tent including modeling, texturing, material setting. 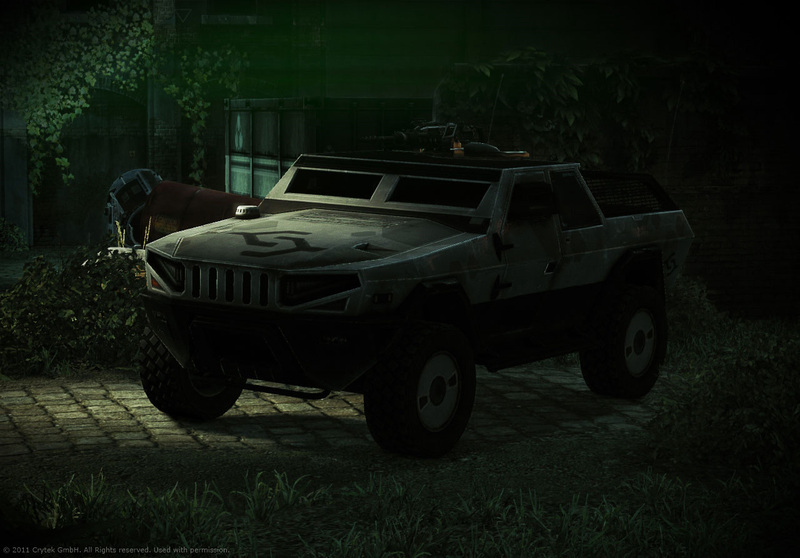 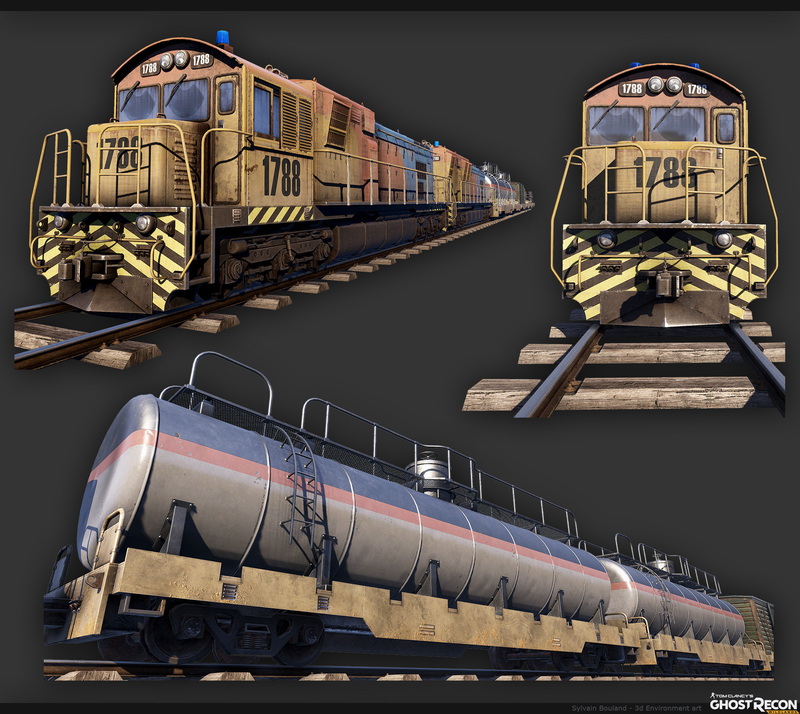 I have done the emergency car including modeling, texturing, material setting. 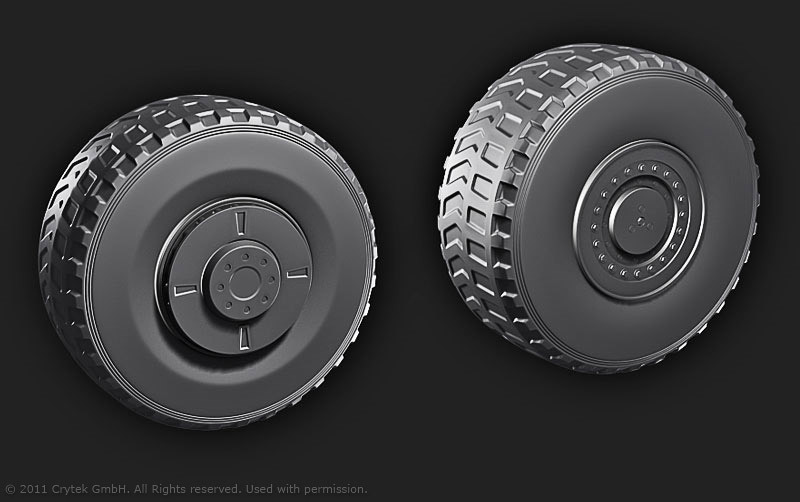 I have done the car including modeling, texturing, material setting. 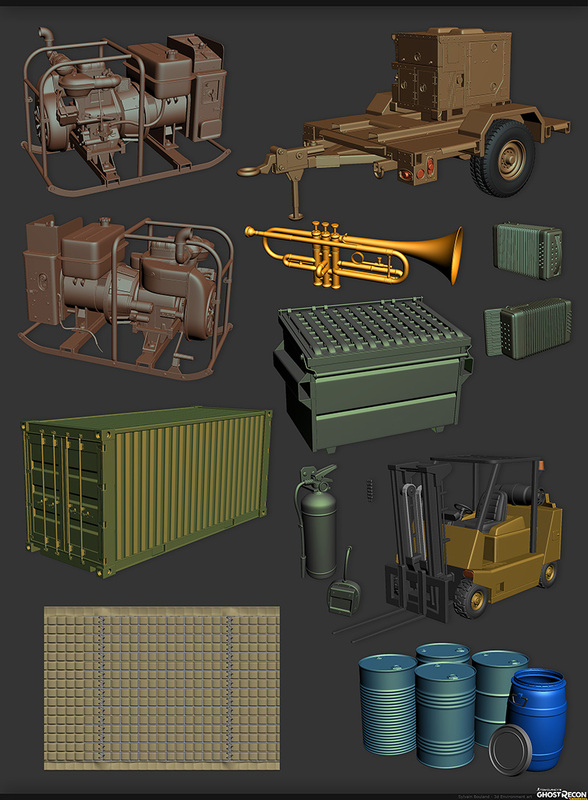 I have done the bus, including modeling, texturing and material setting. 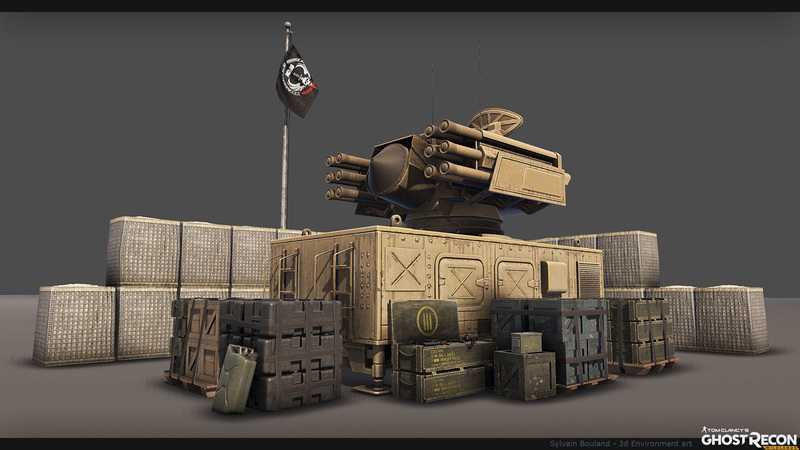 I have done the textures and the material setting for the LTV. 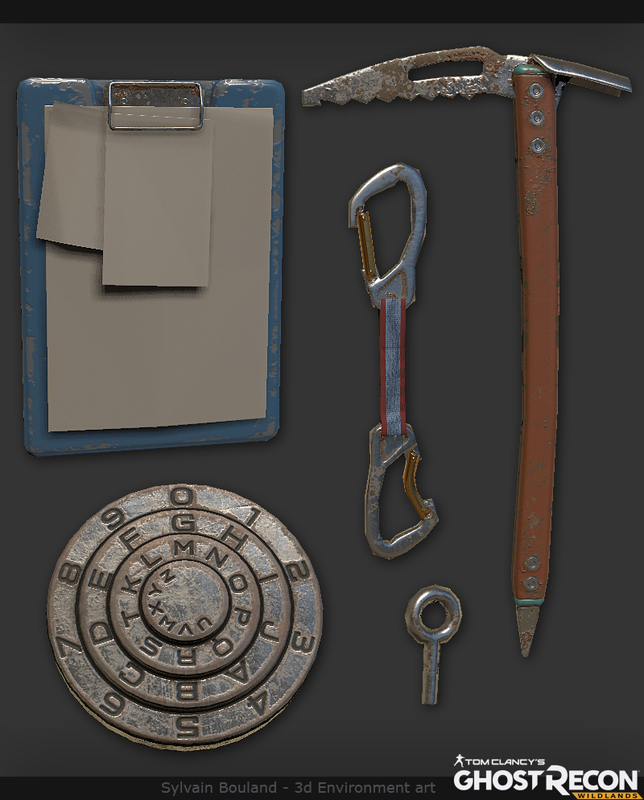 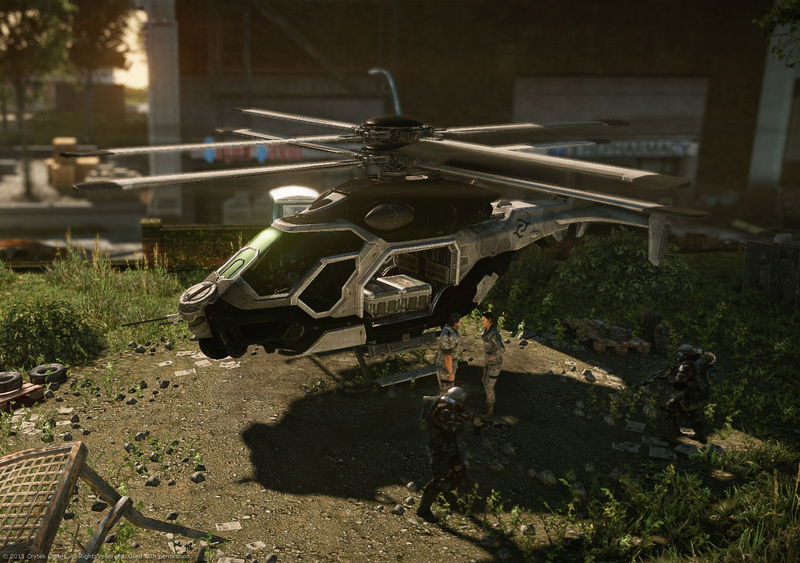 I have done the textures and the material setting for the Helicopter. 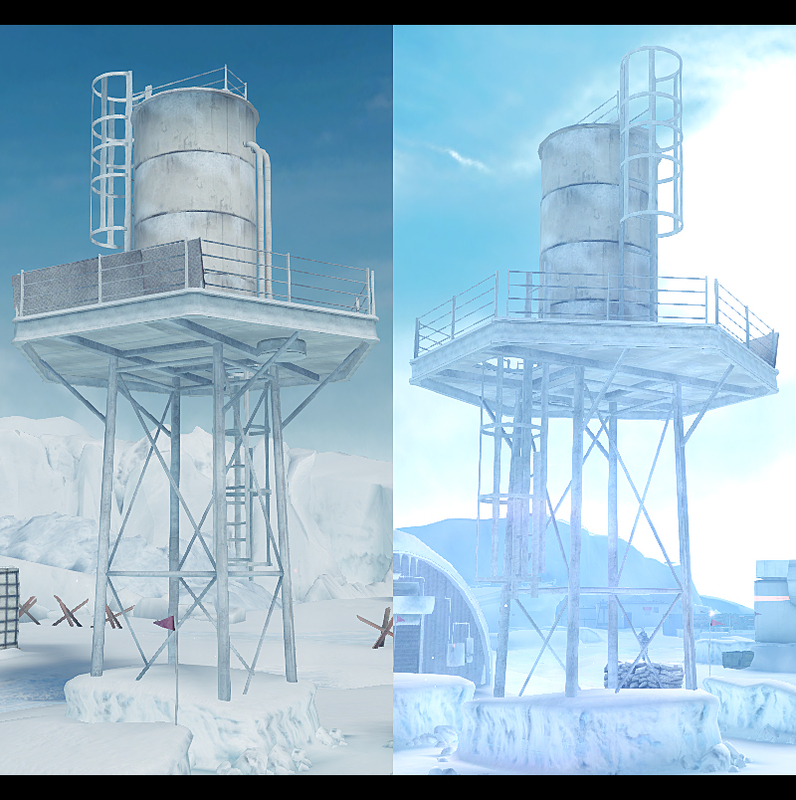 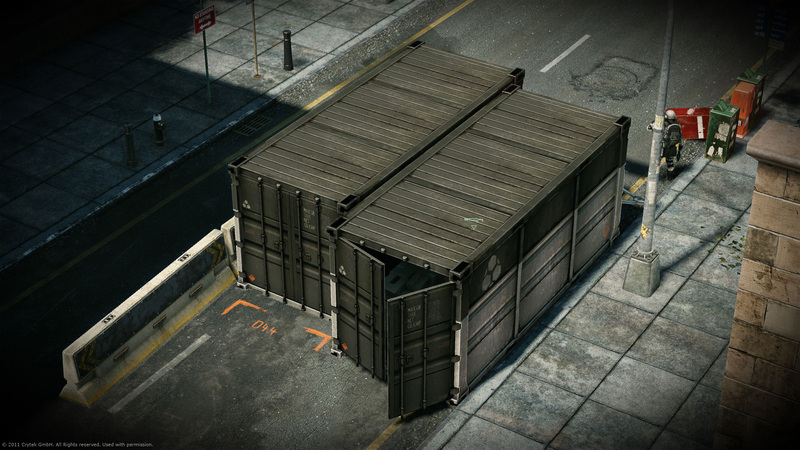 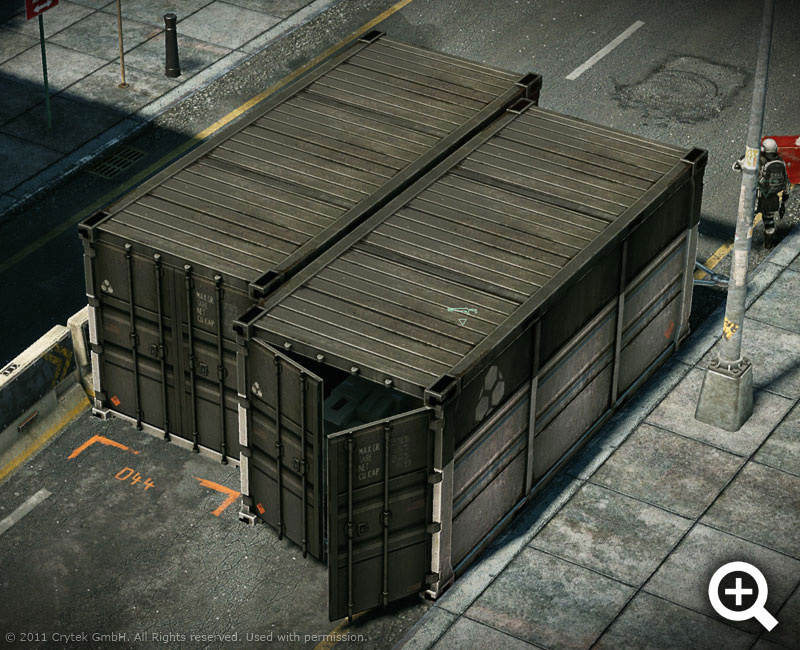 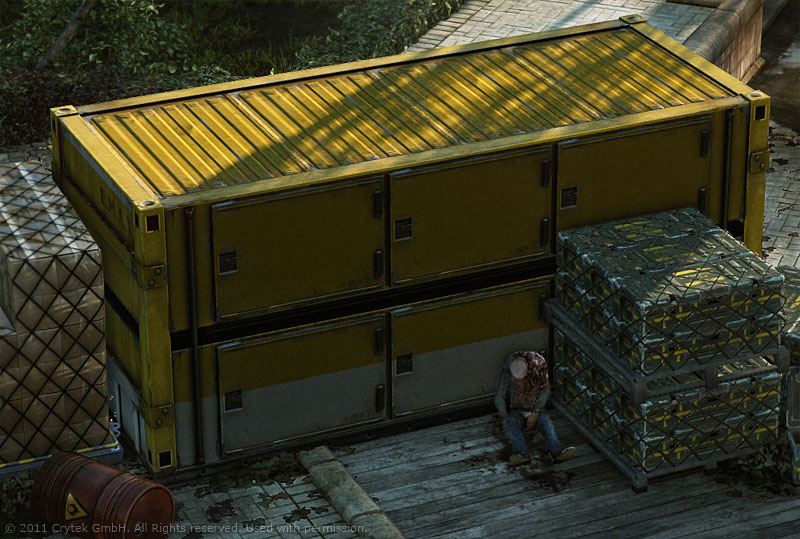 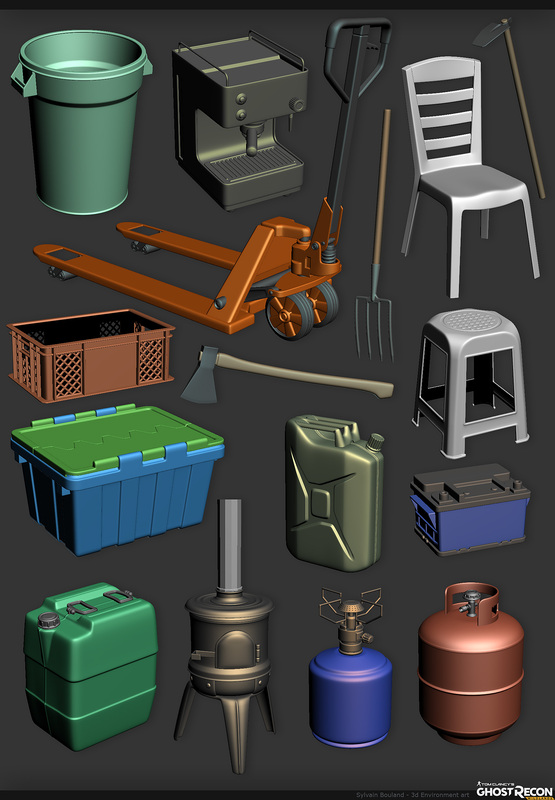 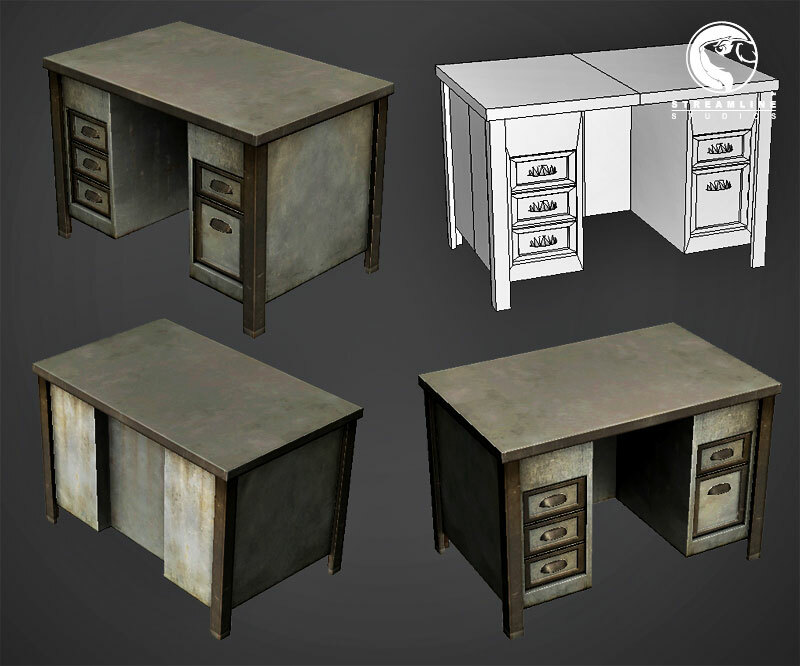 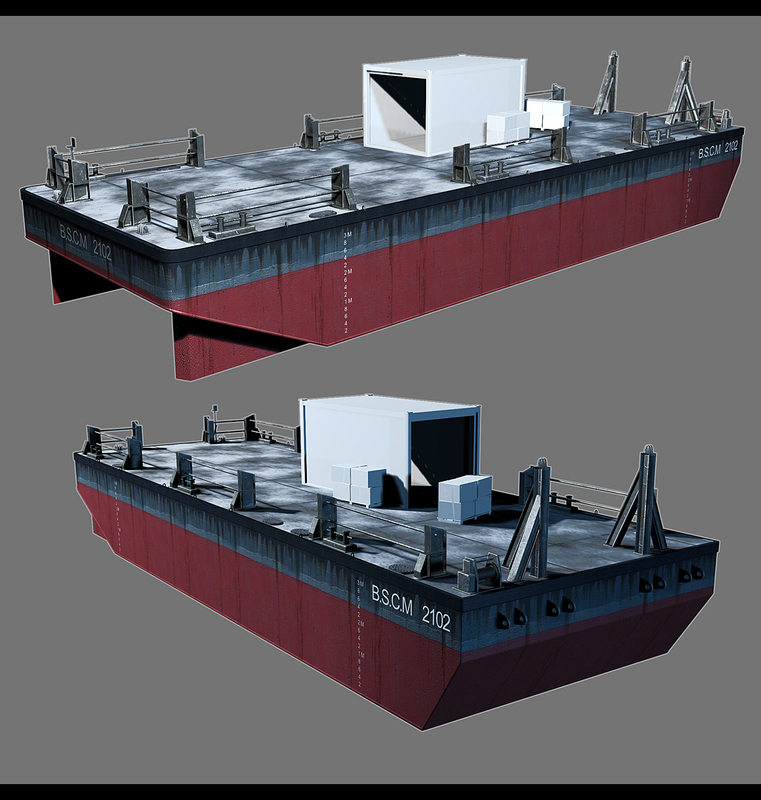 I have done the container including modeling, texturing, material setting. 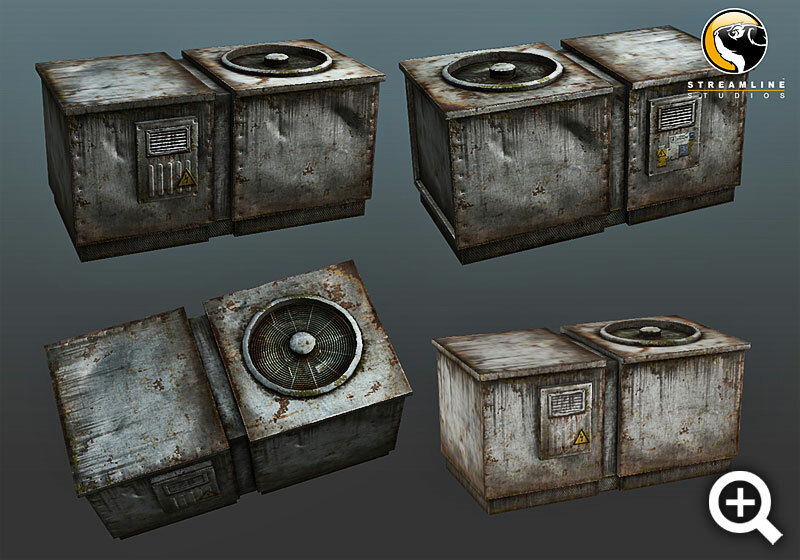 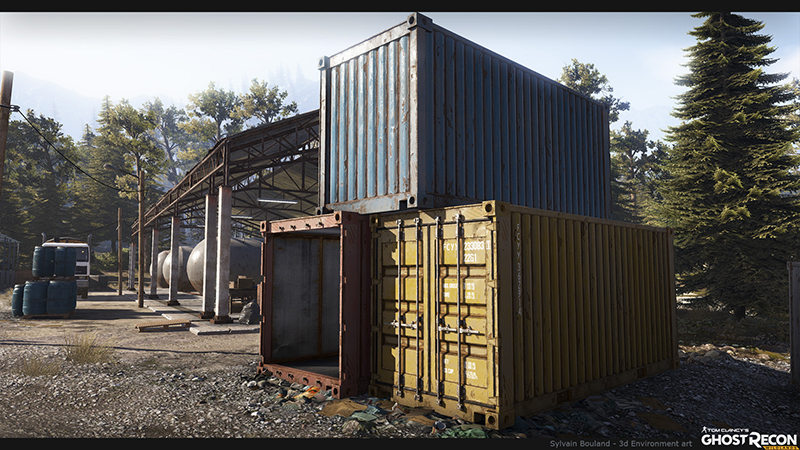 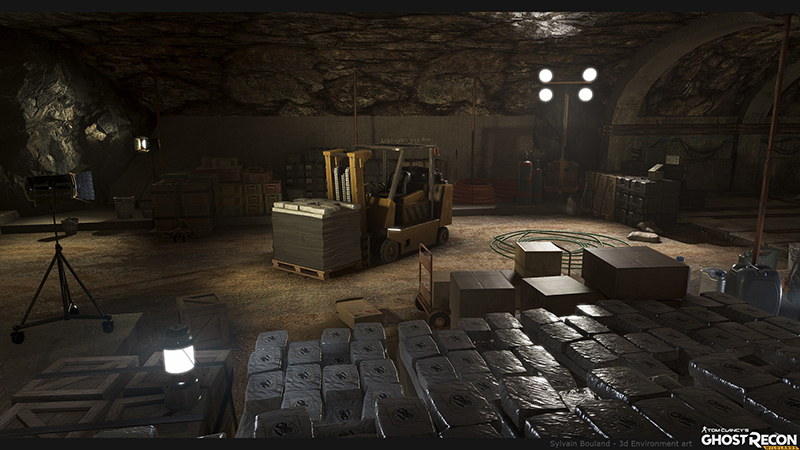 I have done the the container including modeling, texturing, material setting. 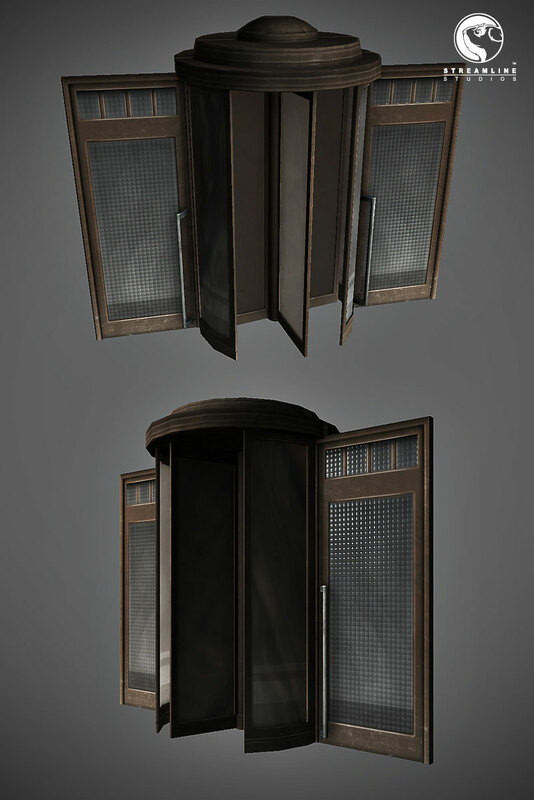 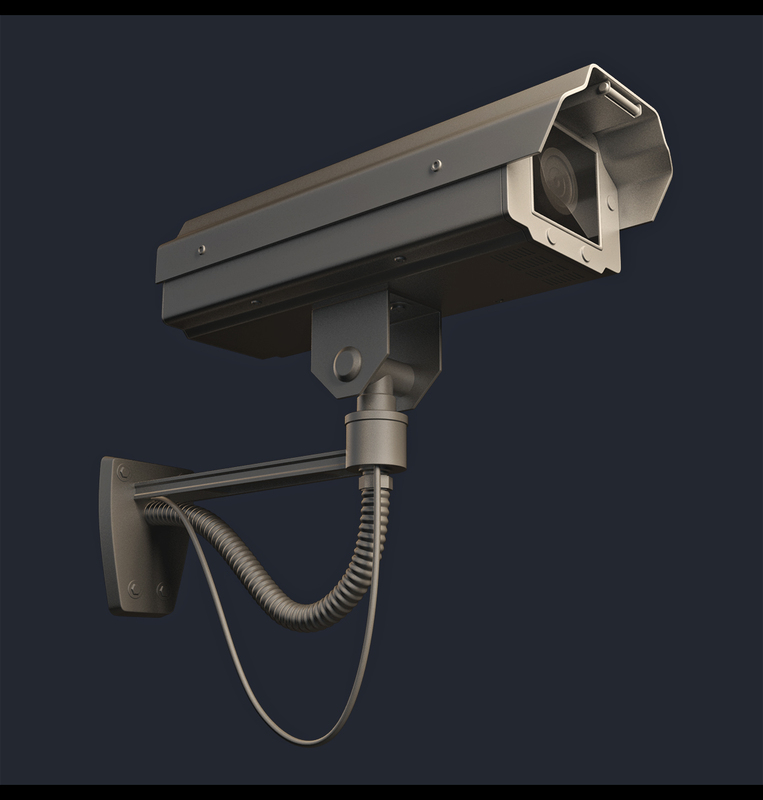 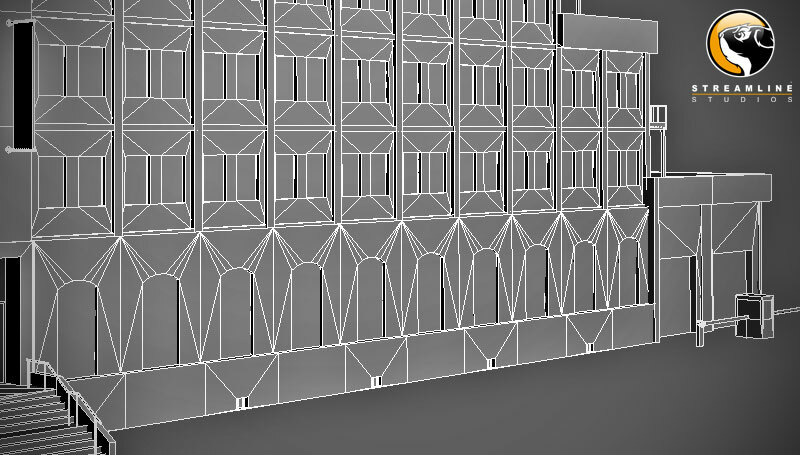 I have done the Mesh, Uvs and the material setting for the security room in the middle. 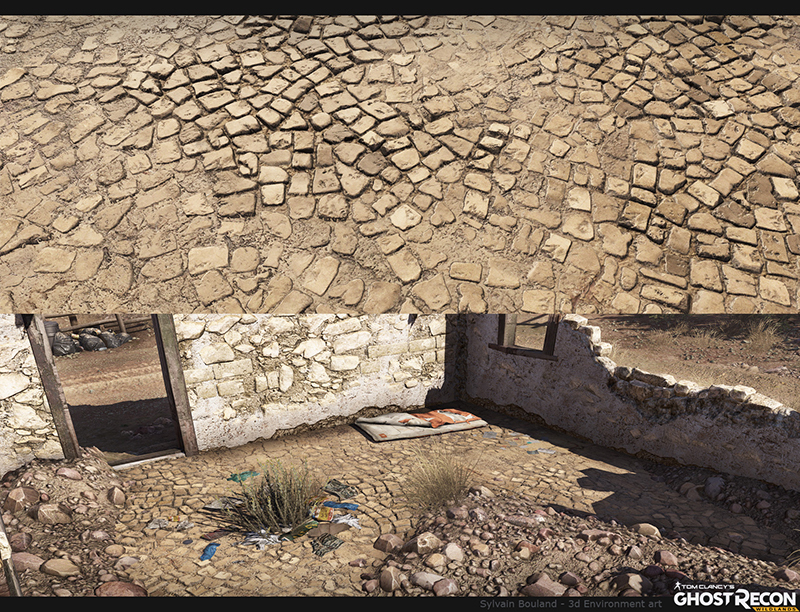 I re-used existing textures. 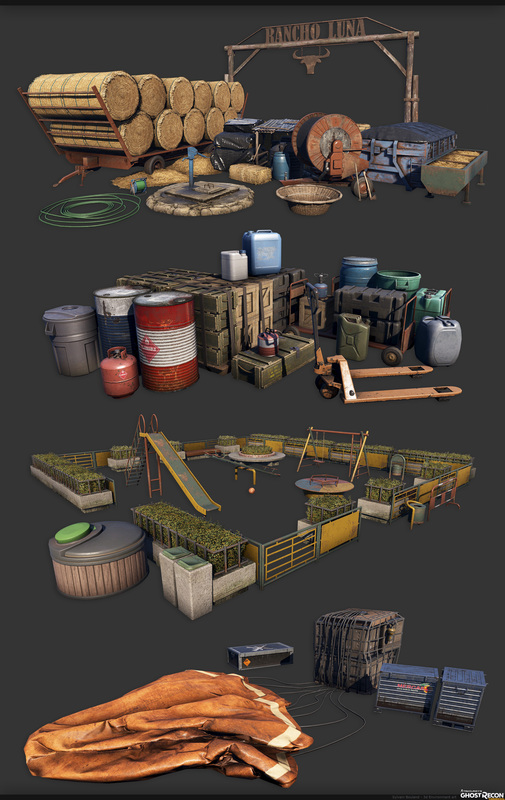 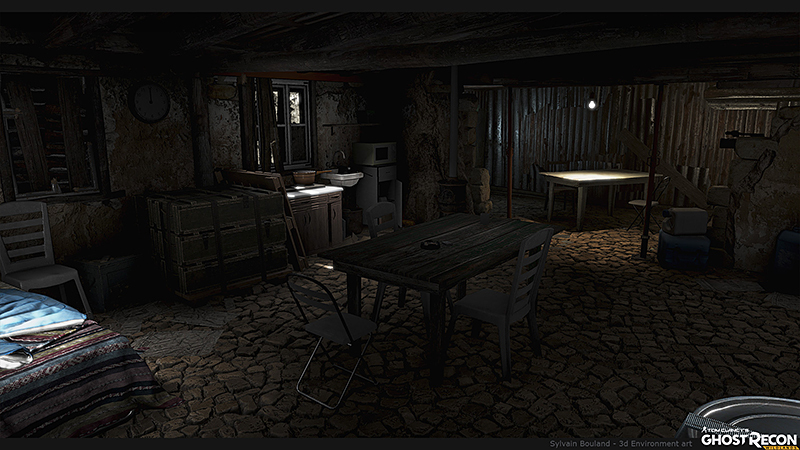 I have done several environment and prop assets for this game which have been cancelled due to GRIN closing its doors. 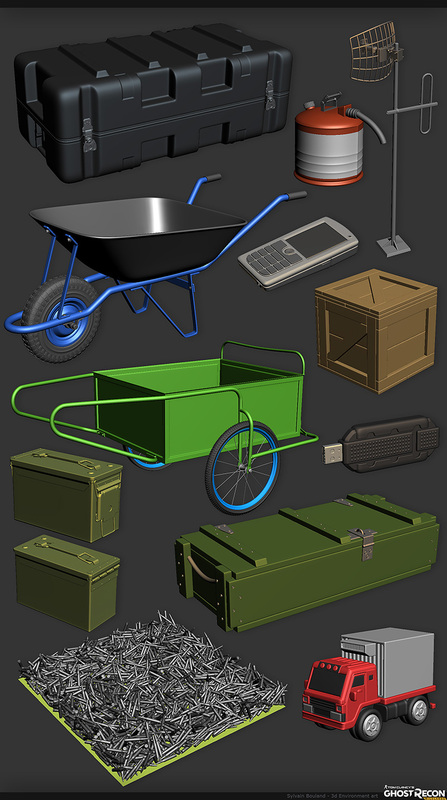 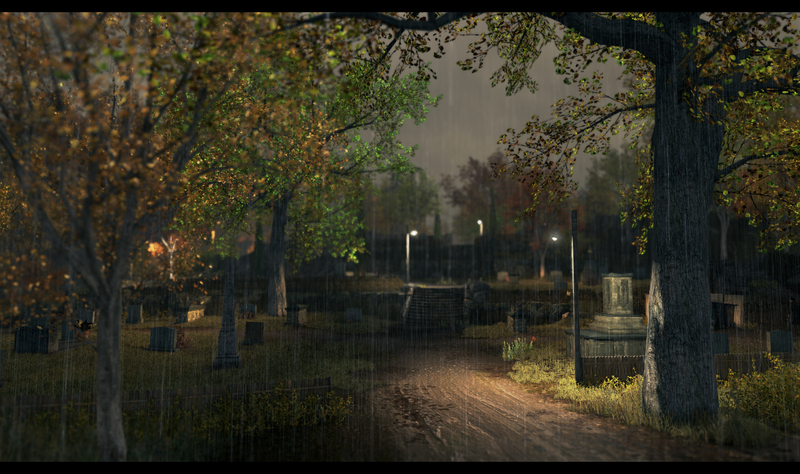 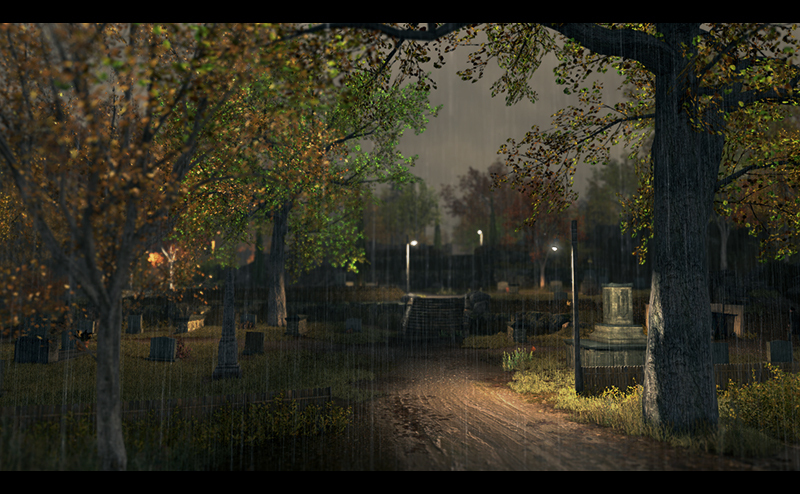 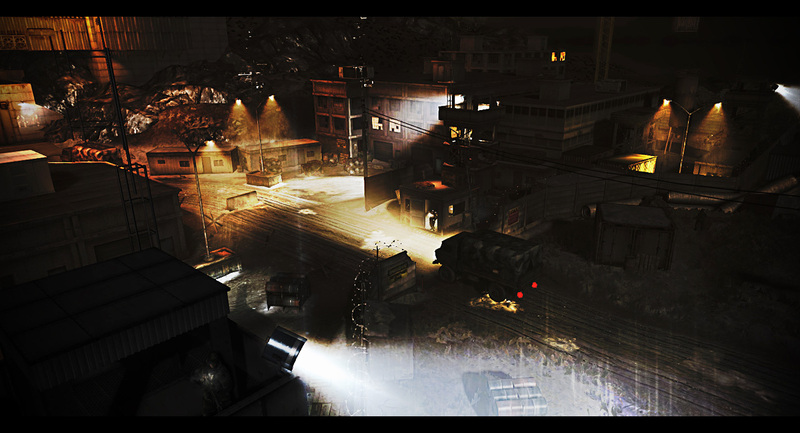 Real time screenshots from 3Ds Max. 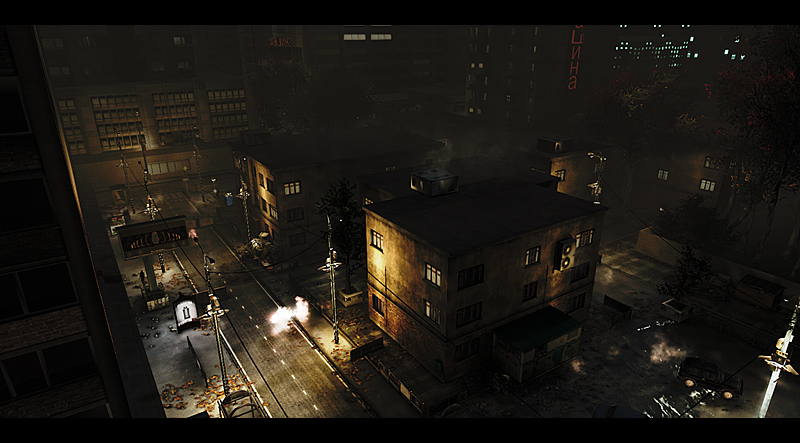 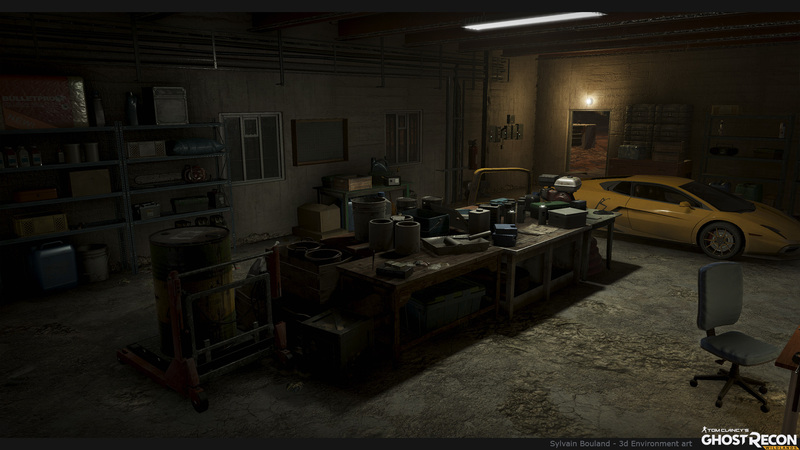 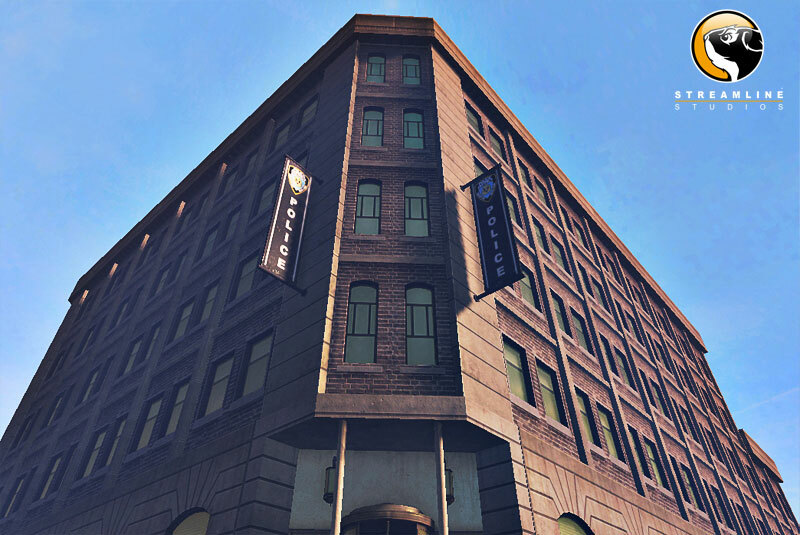 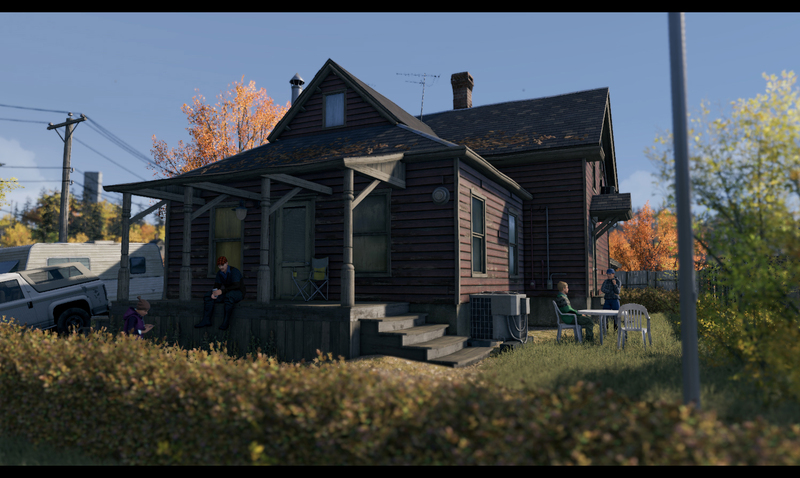 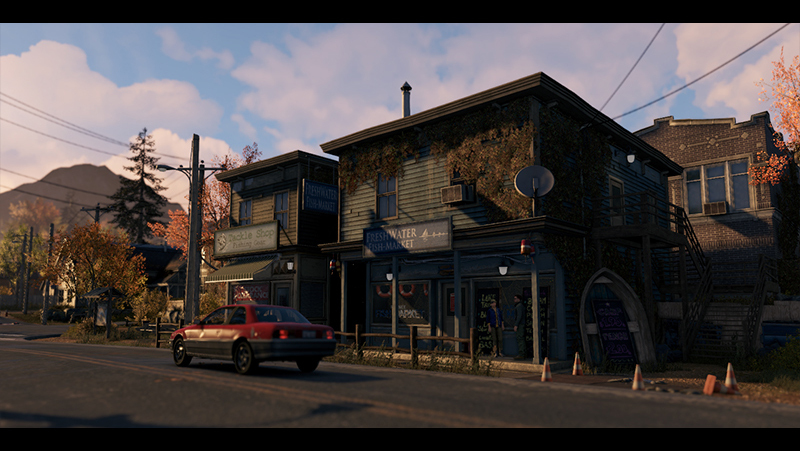 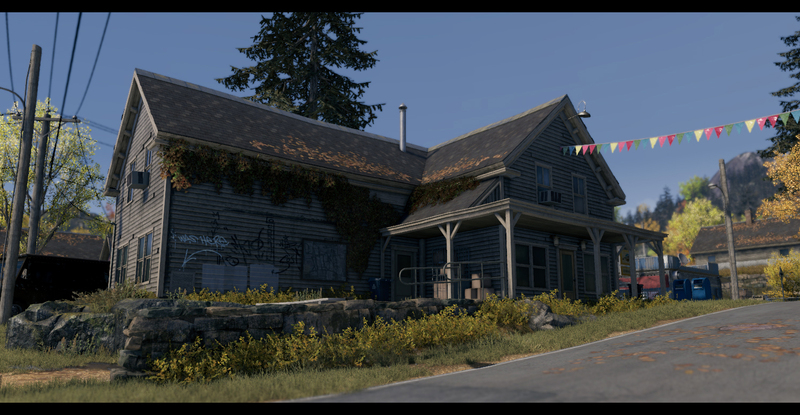 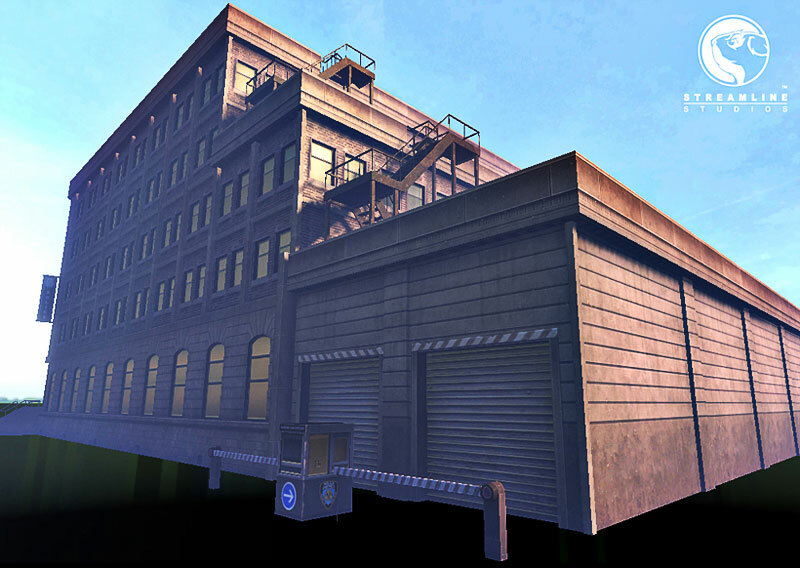 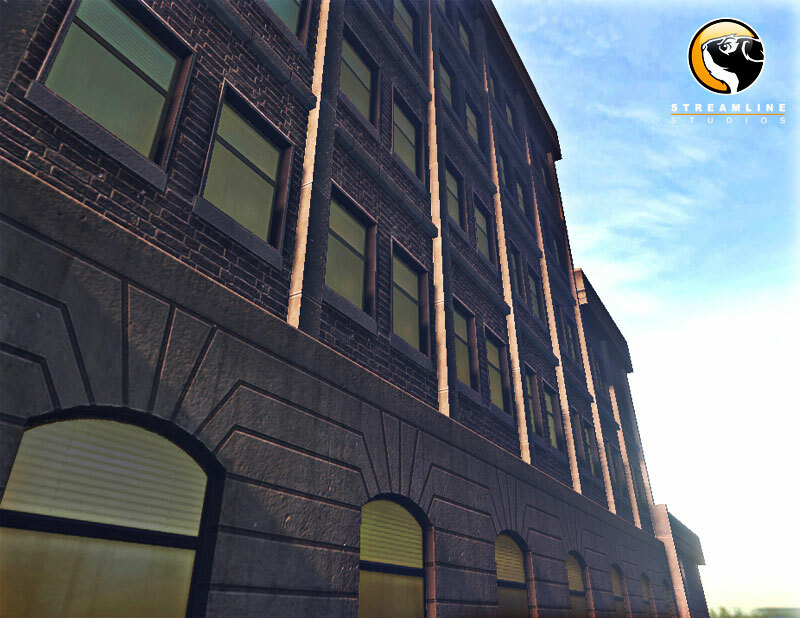 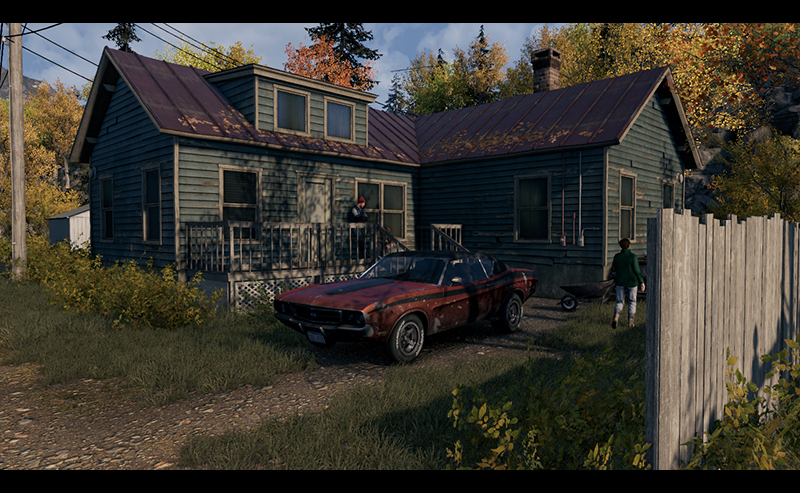 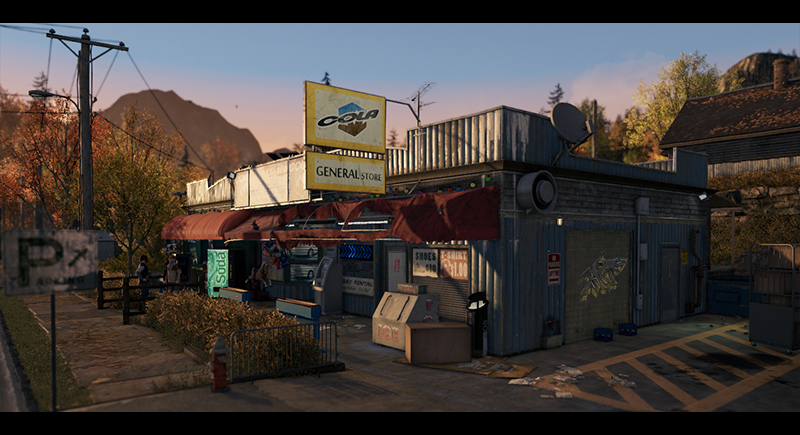 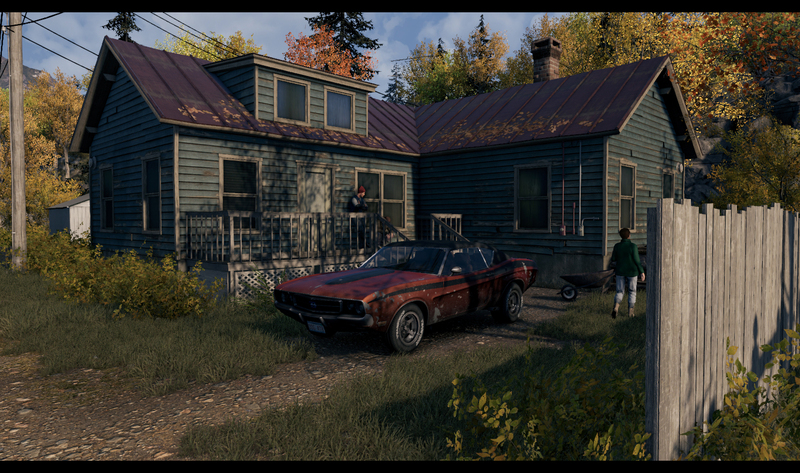 Police station screenshots from the Grin Engine. 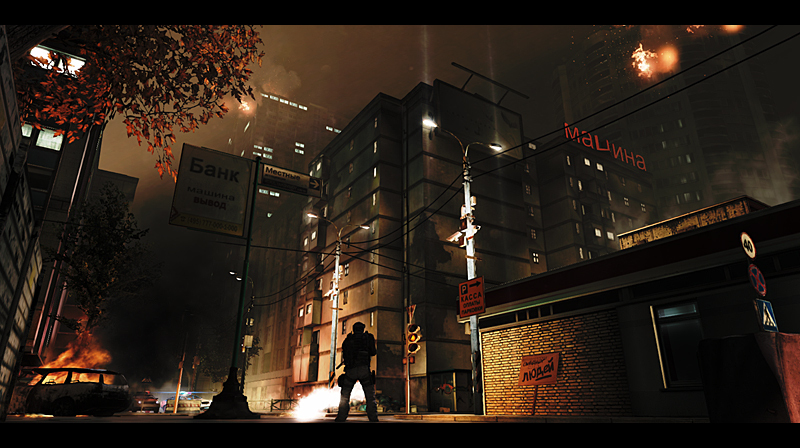 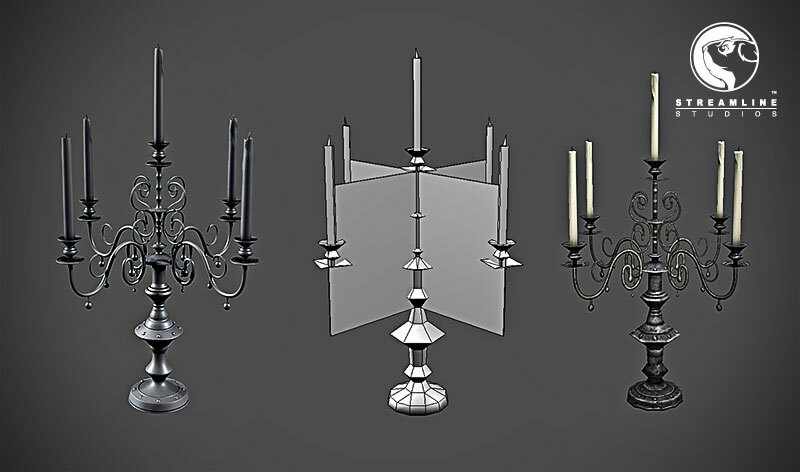 Real time screenshots from 3Ds Max. 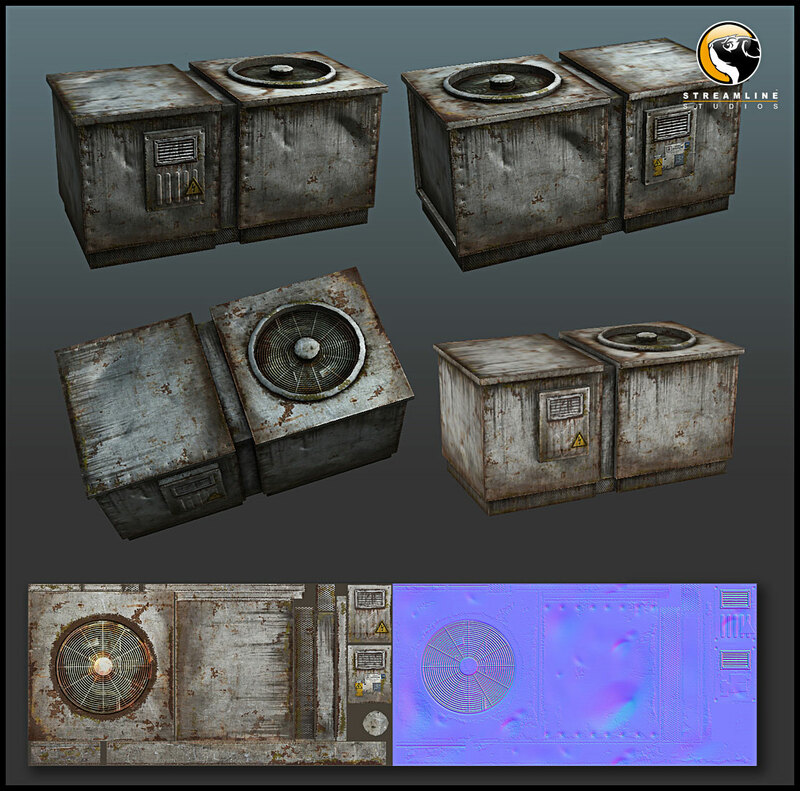 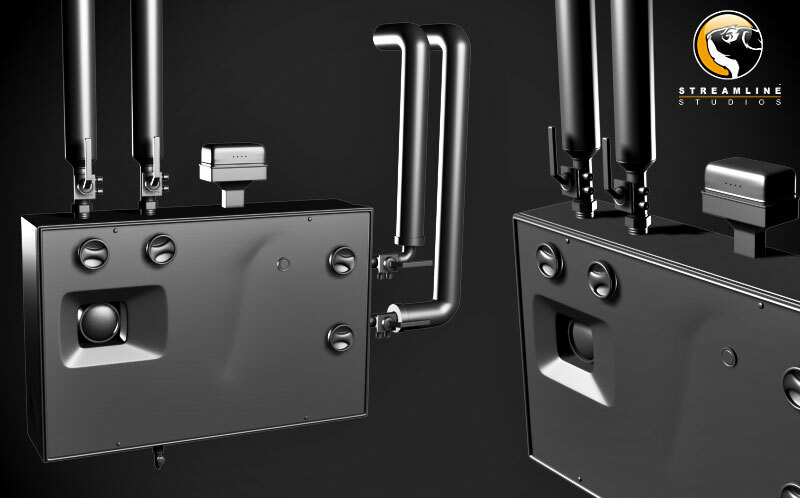 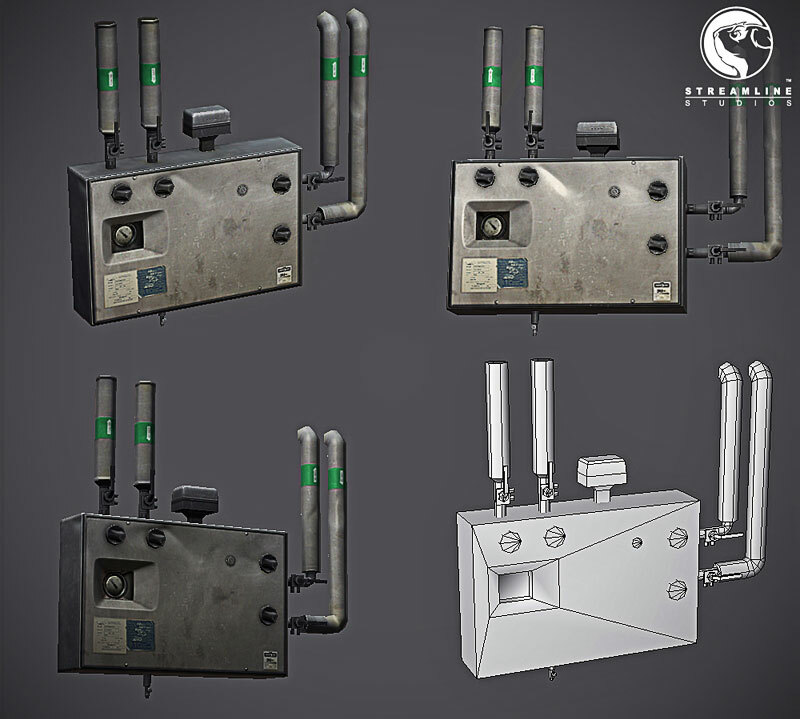 I was in charge of texturing this AC unit, mesh by Streamline Studios. 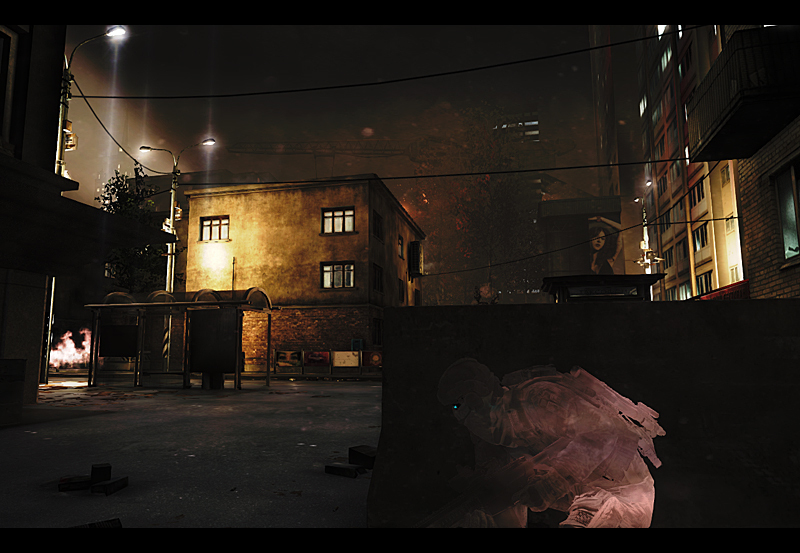 I was in charge of modeling the visual.